We both slept well last night but woke up feeling tired and just a bit abnormal; nervous, anxious, no appetite …. but didn’t give it much thought. 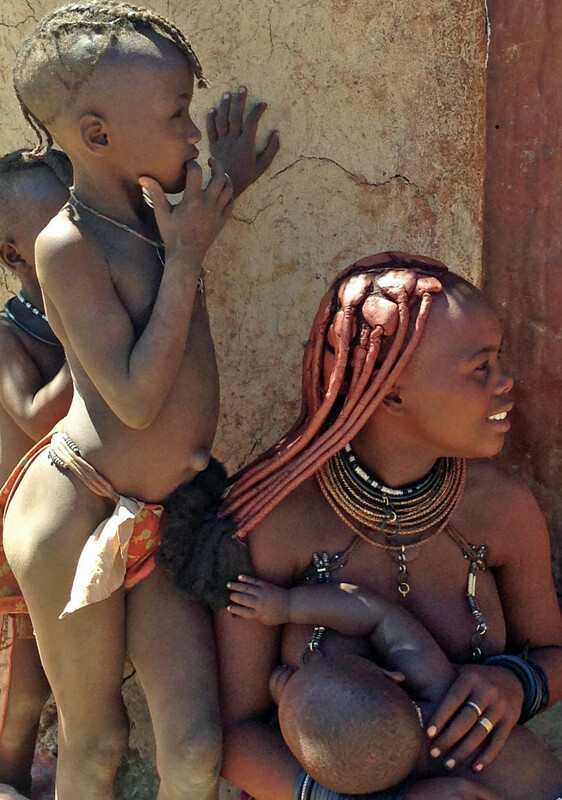 I had been highly anticipating this day – a visit to one of the villages of the Himba, a “semi-nomadic tribe living in scattered settlements……whose women are noted for their unusual beauty and intricate hairstyles and traditional dress…..they rub their skins with dark red ochre….” (notes taken from Kiboko’s notes). Our crew told us that they typically will shop for food for the village being visited as a sign of respect and gratitude for allowing us a glimpse into their lives. In addition, we collected more money from each of group members to add to the pot and ended up with lots of groceries ….. big bags of their staple, maize, and oil and …… I am unable to remember what else we bought. 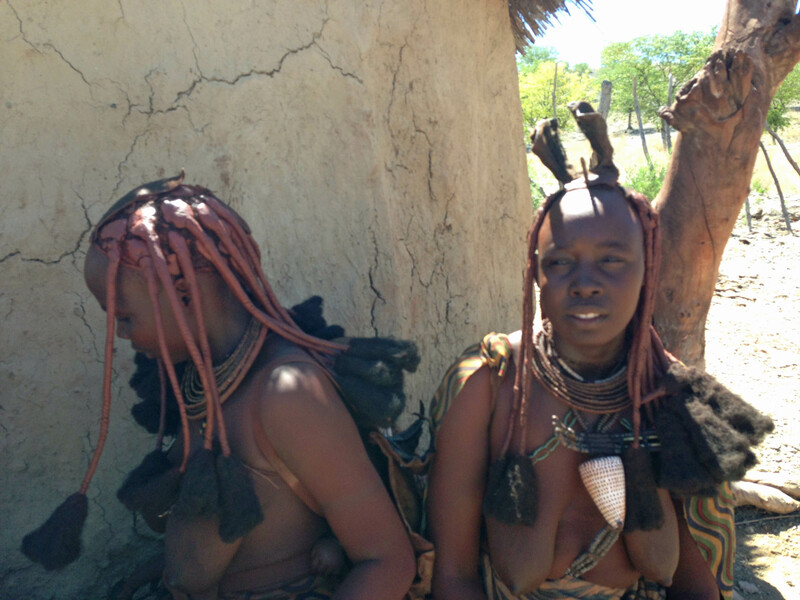 We also picked up a Himba guide who spoke some English and who was to be our translator in the village. When we were finally ready to go, groceries packed into the ttruck, guide already in narrative mode, I started to feel sick and had to stop the bus, thinking I was going to start with what Mike had. There was absolutely no way I was going to sit on the bus and go through what he had the day before so when the offer was made to drive me back to camp, I accepted. I missed the visit but dear Claire took my iPhone and took some pictures for me …. and here they are. Woke up feeling much improved … Compared to yesterday I would say resurrected would not be too exaggerated. Tilly wanted me to go with the rest of the group but NO WAY was I leaving her after the care she took for me. 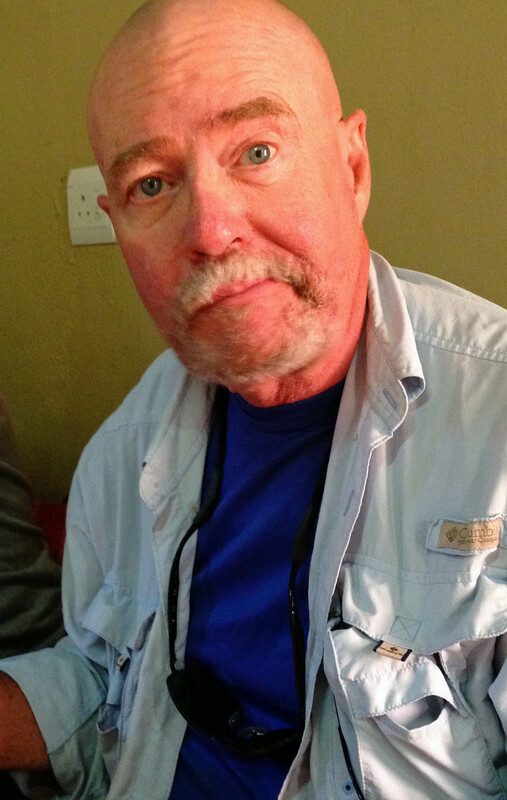 I never did get sick the way Mike did …. just some extreme nausea but after resting in the tent until everyone came back, we were both more or less back to normal and with the others, trooped over to the lodge for an afternoon of poolside R & R.
It was Christmas Eve and we had planned an evening of “Secret Santa”and so, after a relaxing afternoon, we headed back to camp to decorate our tree, wrap the presents and stash them in the tree. We poured wine and ate sparingly of the nuts and chips on offer while we entertained each other with Secret Santa antics. 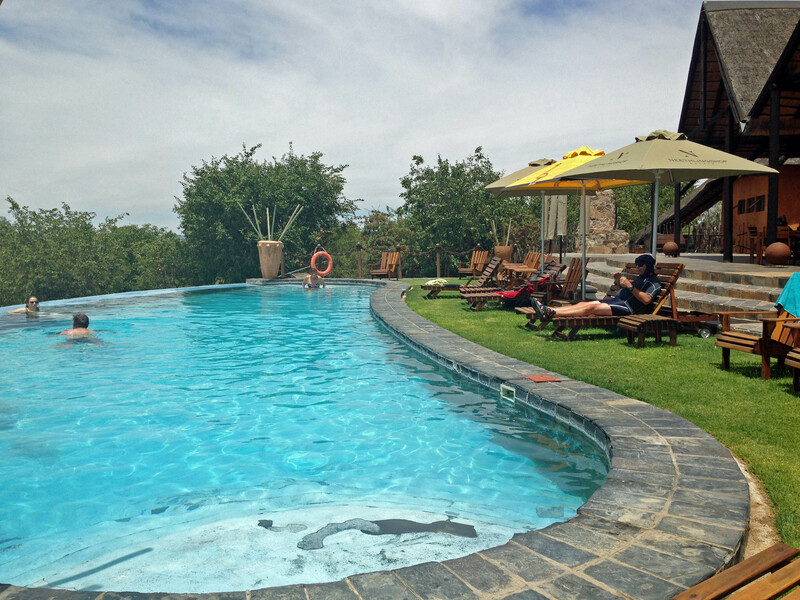 Dumi, Richard and Mandhla had never played it before so it was just that much more fun. They had prepared a Christmas dinner of gammon (pork), corn on the cob and a cheese bake. We didn’t eat much but what we did eat was very fine!! Richard told us a Christmas story about growing up with very little money …. so little that they had only bread and peanut butter for their Christmas dinner! How fortunate were we this Christmas? This was the day I was convinced that Mike had contracted Ebola!!! The day began perfectly. 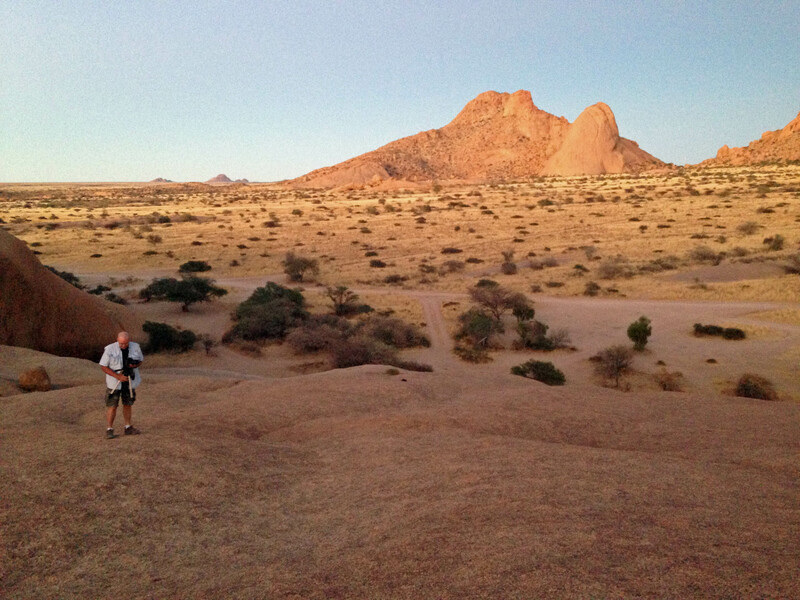 Mike had set his alarm for 5 am so he could climb Spitzkoppe in time to photograph the sunrise. Much to the surprise of both of us, I managed to wake myself up enough to join him on the mountain. 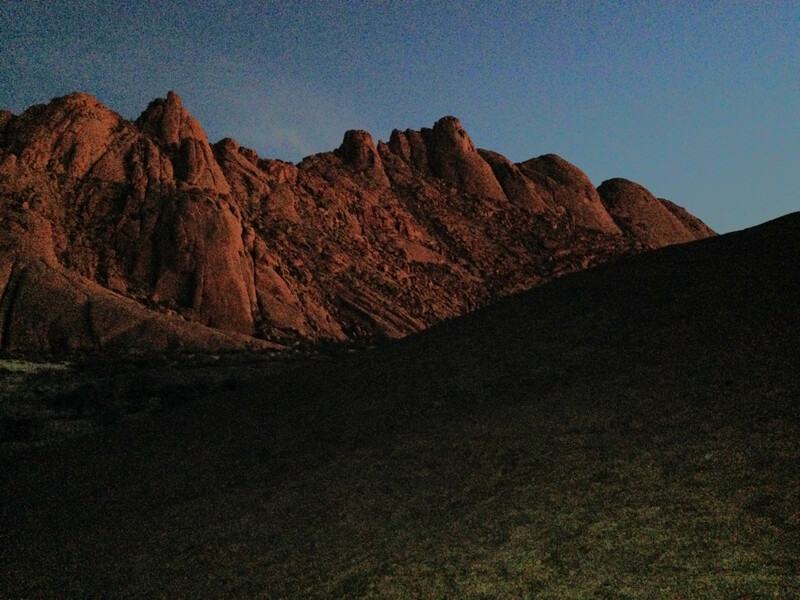 It was truly spectacular . . . . from almost completely dark to the first lightening of the sky to the full splendor of the newly awakened sun casting its rays on the surrounding rocks. 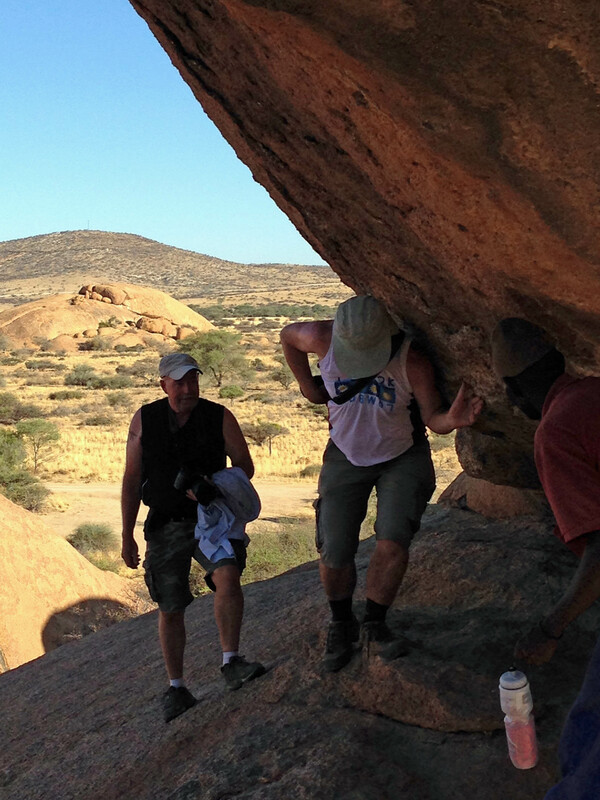 As we were leaving Spitzkoppe, we found a cave. 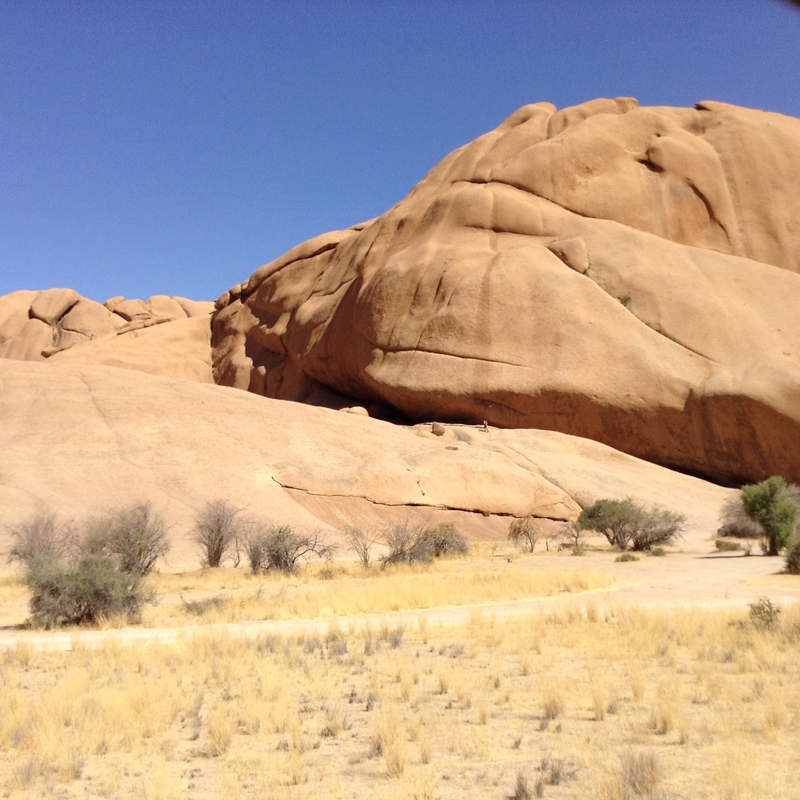 Richard told us that tribe members will go to a cave like that with a candle and some medicine from the local shaman and will spend ‘alone’ time there, meditating. . . . communing with the spirit world . . . . time spent in prayer and ritual. 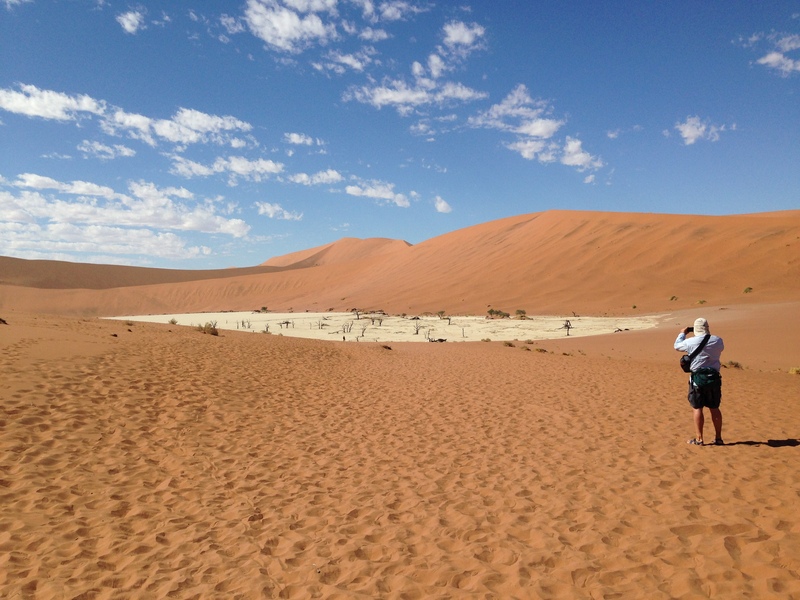 We were enroute to our next 2 nights in Kaololand, reputedly one of the most remote, harsh environments in Namibia. It was also one of the longest days in terms of the number of kilometers we were to cover. 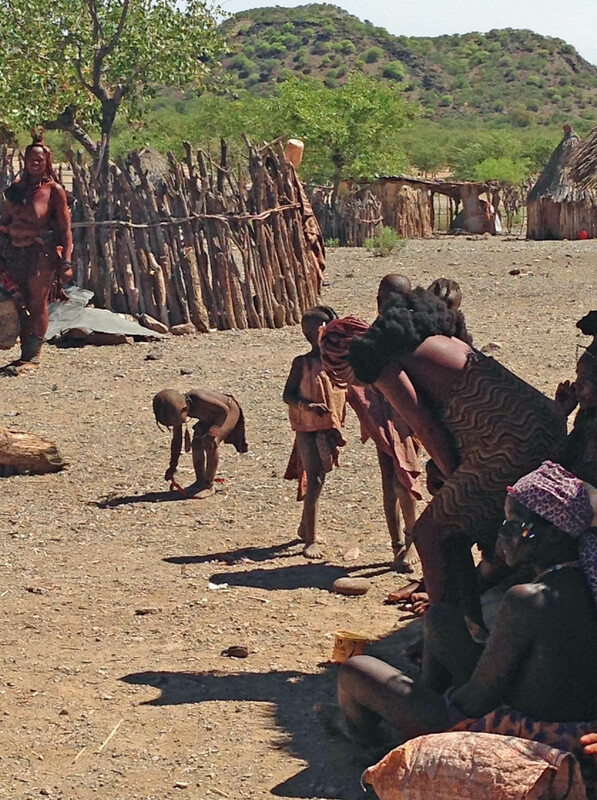 In Opuwo, our final destination and where we would stay for 2 nights, we had a visit planned with the Himba people. It was one of the things I was most eagerly anticipating. 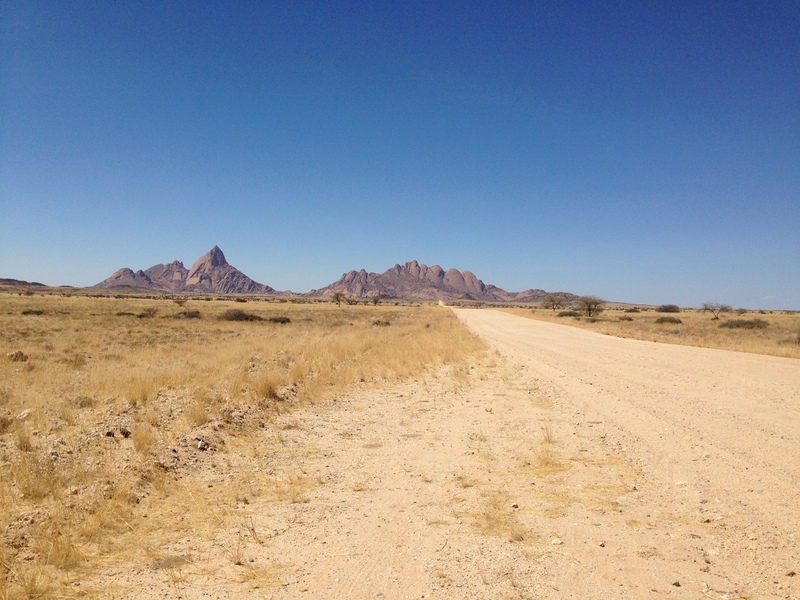 The first part of j ourney took us through Damaraland, the north-central part of Namibia. 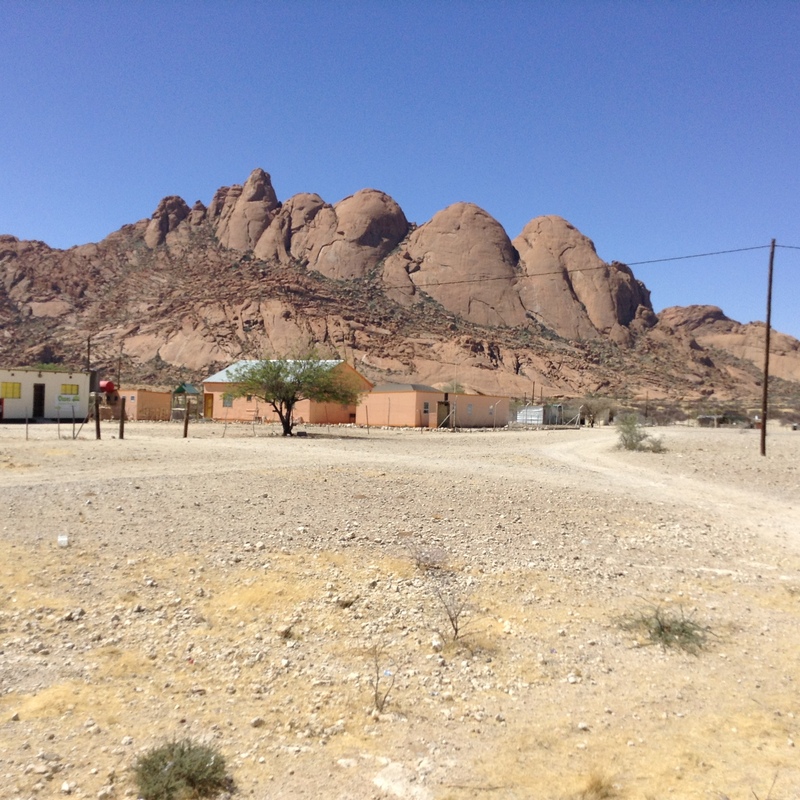 The Damara people who live here are an ethnic group making up 8.5% of Namibia’s population (thank you Kiboko for those facts and figures). 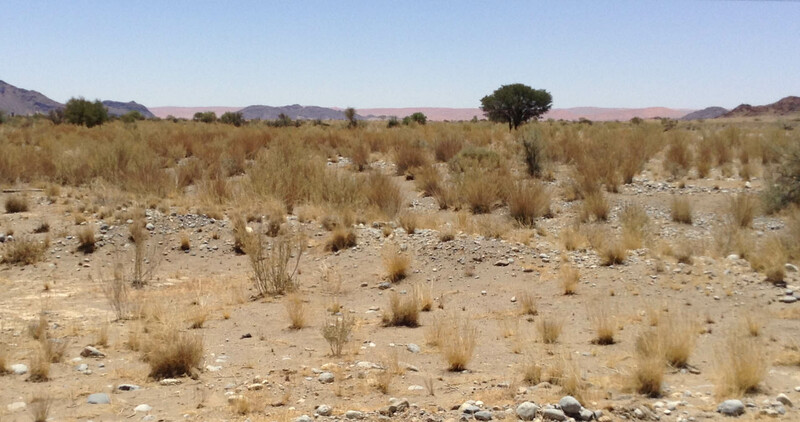 We had been informed in our pre-trip information that the terrain here is rugged, consisting of mountains interspersed with gravel plains and hot, sandy valleys. We entered elephant country and started to see numerous “caution elephants” road signs. We never did see any at this point. The road was rough and by 830 am, Mike became violently sick. 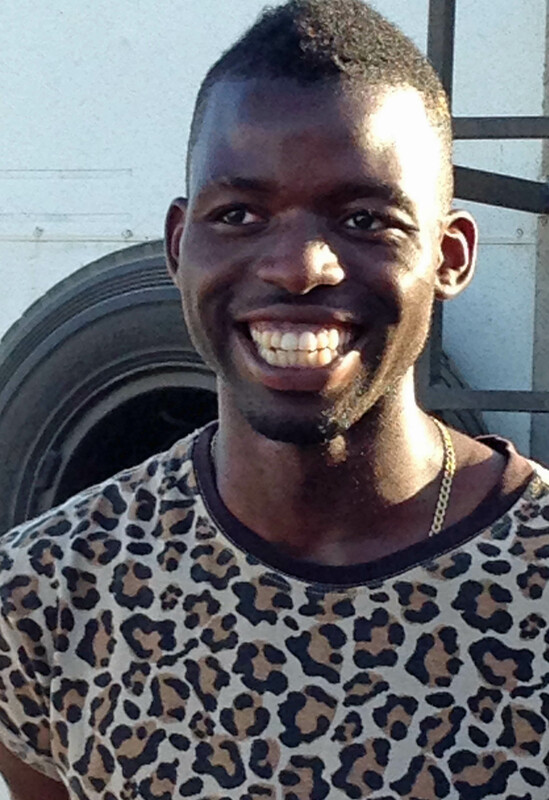 Dumi barely had time to stop the bus. Initially, I thought Mike was sick from the combination of cough medicine, wine the night before and the rough road, but as the day progressed, Mike went from bad to worse. From 830 am until late afternoon, he was sick, both ends trying to clear his system of whatever had disturbed it so viciously. Every hour we had to stop the bus. It got so that I dreaded any change in the motion of the bus. Every time the bus slowed down, panic-stricken, I would grab the roll of tissue and a plastic bag and support Mike out the door to his new favorite spot by the rear wheel. By afternoon, he could no longer stand up or support himself . . . Dumi and Richard had to help him or he would fall. 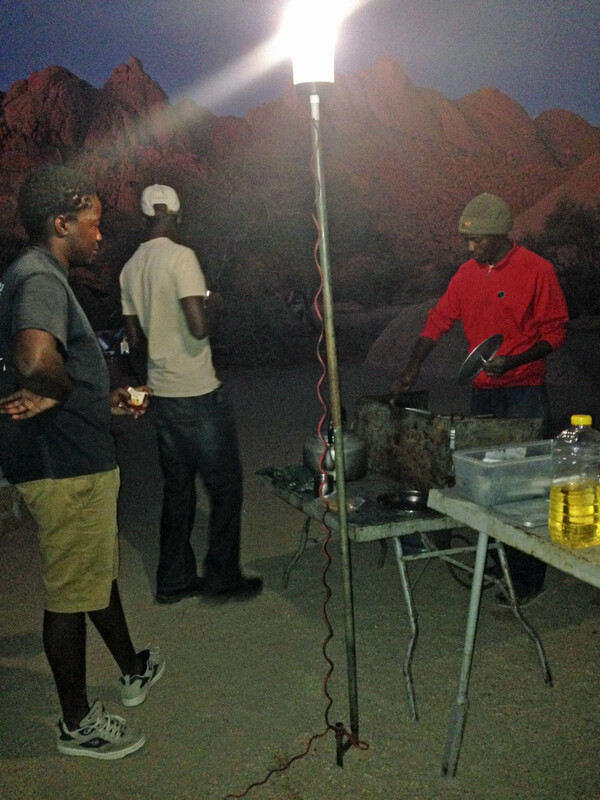 Meanwhile, we were in the middle of nowhere in “one of the most rugged, inhospitable regions of Namibia”. Trust Mike to choose this day to be sick. Today was the shits, literally. It was both the longest drive of the trip and the roughest road too. 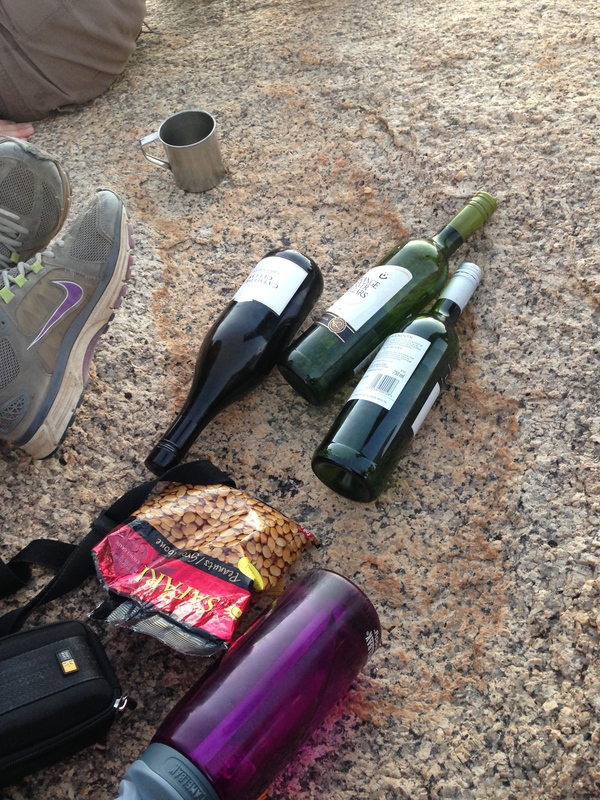 We started out as usual but the road was very much rougher than I thought it would be which would have been bad enough… but I caught a bug ( besides single handedly downing an entire bottle of red wine last night.. incredibly STUPID!) and after about an hour of bouncing I was sick … Out of the bus and spewing from both ends…. I had lots of time to think and worry on this worst of all days. I thought back to when we entered South Africa at the Cape town airport and being ordered to “go this way if you have been in an Ebola infected country”. But there didn’t seem to be any enforcement of that order that I could remember seeing. 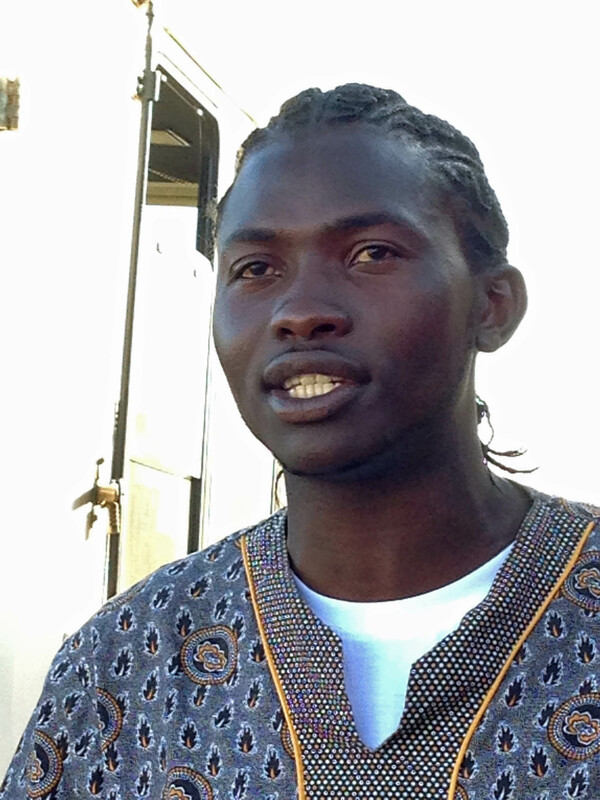 When we entered the country, Ebola was the least of my worries . . . I didn’t give Ebola a second thought, my mind being much more occupied with the adventure about to begin. I did, however, think to myself as I was going down some stairs, my hand resting on the bannister, that I must be sure to use my hand sanitizer. Of course I forgot. I had never ever seen Michael so sick before – I started to think maybe ???? Especially since all of us on the trip had been eating the same foods . . . he was the only one who got sick. The rough roads not only created a problem for Mike bus also for the bus . . . a problem with a brake line. Fairly early on, we stopped at the side of the road for the crew to try a patch job until we got to the nearest service station. A short distance up the road stood a rustic stand operated by three Damara women and their children selling handicrafts they had made. We decided to shop while we stopped. Not for long . . . no sooner had I started to look then …. I followed Mike into the bushes again. 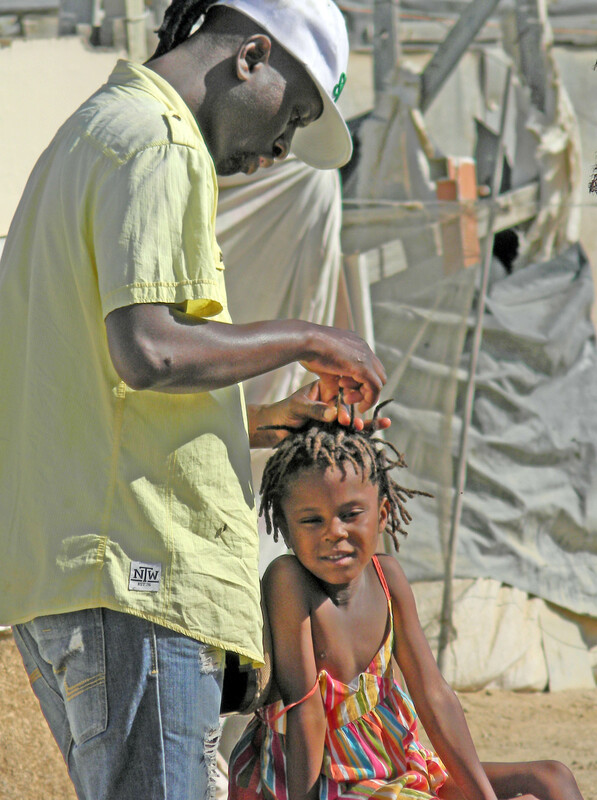 Dehydrated & extremely weak, I had Tilly very worried to the point she was thinking “Ebola?”. I even had to be helped to the bathroom by Dumi …too weak to walk a straight line. We finally found the proverbial service station. We were deposited at a local, enclosed camp/resort spot where we had lunch and where we put Mike on a mat, in the shade to rest. These flowers were a small bright spot during this short stop. So vivid! We waited for about an hour or so for the truck to be repaired and then, once again, we were under way. I have to commend Dumi, Richard and Mandhla. They handled the situation superbly, panic – free (I was doing that for all of us!! ), but steady and helpful. Mike had by this time lost all of his bodily fluids. Dumi made him a concoction of water, sugar and salt and Mike tried to keep it down. Our fellow travelers were incredible also, being supportive of Tilly and understanding of my situation by NOT taking a video for YOUtube posting later. At this point, you’d think it couldn’t get any worse. It did. Mike just couldn’t get comfortable. 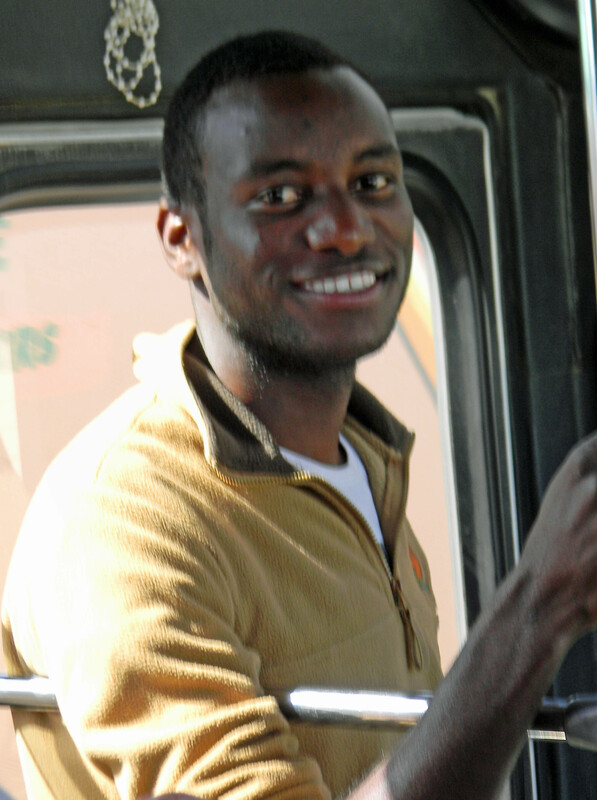 After some discussion, it was decided he might be more comfortable in the cab of the truck, beside Dumi, who was driving. All of a sudden, the brakes went on. There was a commotion in the front seat. I leaped out of my seat, and just as I got to the window and able to see Mike, I saw him having a seizure. He had thrown up again (thank heavens there wasn’t much left by this time). The seizure was very short – only a few moments. We quickly got him out – the nether region was also excreting. Mike told us that he thought maybe he was too hot but too incapacitated to say anything – basically I think he lost consciousness. Little did we know the sun had been shining on him full blast, through his open window, so on top of whatever bug he had, we had inadvertently caused him to have heat stroke too. We soaked everything we could find in water and laid him on the floor of the bus where he stayed for the duration of the trip. Once we got him cooled off, he started to rally and I started to hope that maybe the worst was over. Thank heavens we were finally on a paved road. Finally, after a stop at the ‘already closed’ medical clinic, we arrived in Opuwo, at the Opuwo Country Lodge. Our tent was the priority that evening (it was already 7pm). We were already much later than planned with the numerous stops for Mike and the longer stop for truck repair. I think we were all exhausted. We showered, washed clothes, ate dinner and headed off to our respective tents. Much as we loved camping and were happy and content in our tent, we certainly appreciated ‘real beds’. We woke up early, washed and hung the rest of our clothes and went for the breakfast included in our guesthouse stay. We both had a continental breakfast and coffee. Knowing that shopping was on our agenda and that we only had until noon, we packed up as much as possible and headed towards the shopping area a few blocks away. The previous day, we had decided we would celebrate Christmas Eve by doing the ‘Secret Santa’ game that some of us had done so many times in Christmases past. 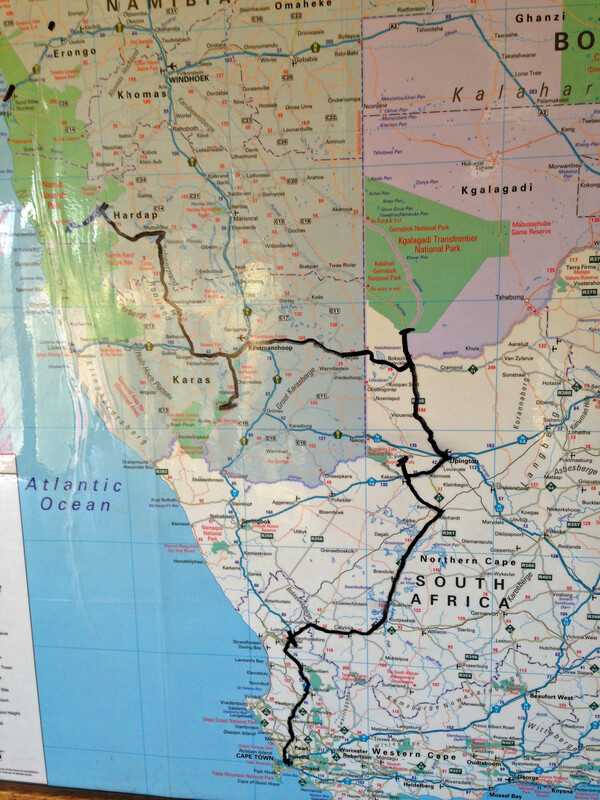 When consulted as to the best day to do this, either the 24th or the 25th, Dumi, Richard and Mandhla enthusiastically agreed to participate and that in terms of our travel plans, campsites, and mileages, the 24th would be the best day. That meant we had to find some secret Santa gifts. Of course, we were looking for grand baby gifts too – you never know if the grand baby might turn out to be as much of a gypsy as Mike and I. The Bush Babies were still slumbering after their night on the town so Rhea decided to join us on our shopping spree. 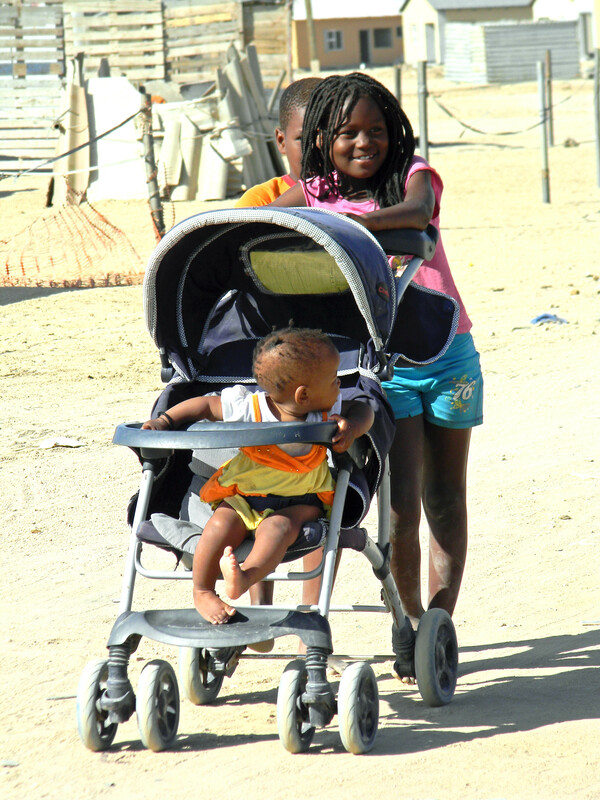 We discovered to our delight, that Swakopmund is a really ‘tourist friendly’ little town with lots of great shopping. I bought a travel mug and a fly swatter for my secret Santa gift; Mike bought a set of plastic wine glasses for his gift and we found a small present for the ‘baby’. Some mosquito repellent cream, sunscreen and Advil cold and flu meds completed the shopping list. We returned to the guesthouse to pack and put things away, buy water for 2 days and have lunch. Lunch was a Greek salad, bread and melon. From Swakopmund we made our way north along the coast. 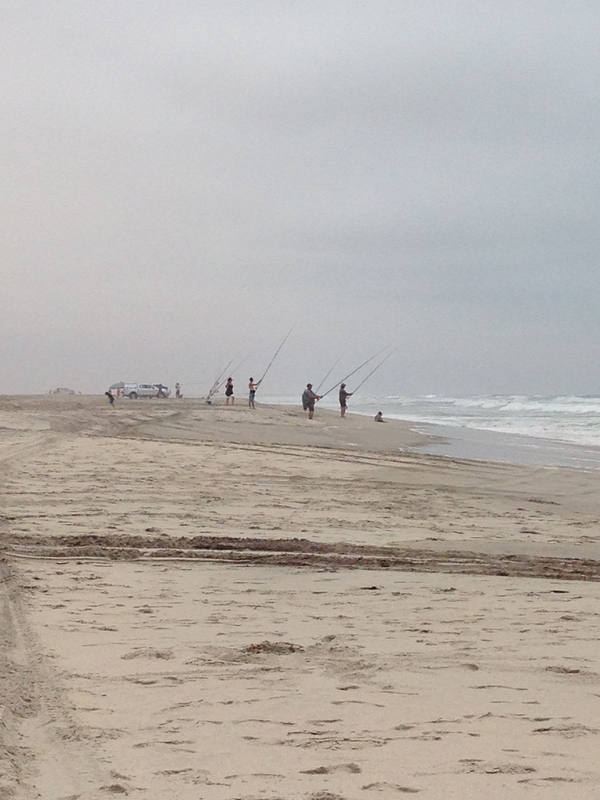 The ocean was in view the whole way , miles and miles of sand, surf, and sea. We even dipped our feet in the Atlantic Ocean. We stopped to see a ship wreck and just had to test the waters. 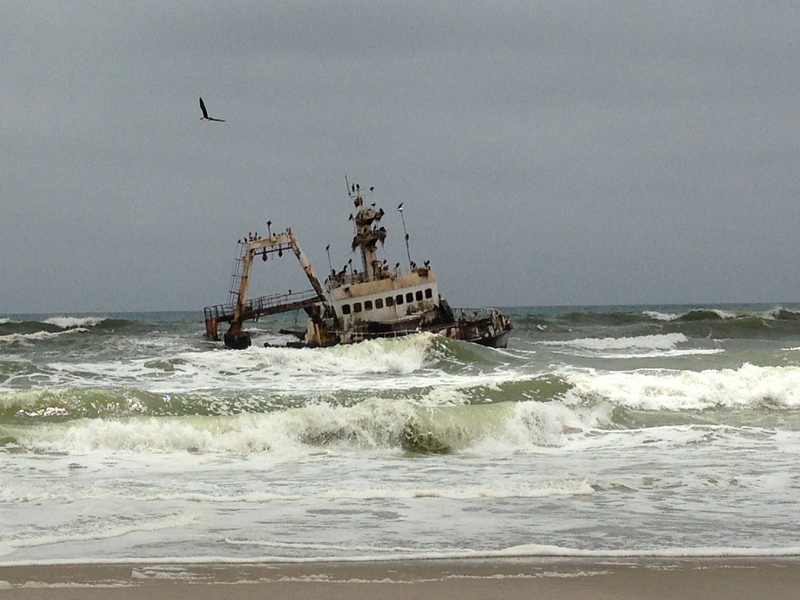 The Zeila, a fishing trawler, being towed as scrap metal to India in 2008, came loose from its towing cable, becoming one of the many ships which, over the years, have become stranded on ‘the Skeleton Coast’. We all were fascinated not only by the ship but also by the waves crashing onto the shore, and the fishermen further up the coast. The Atlantic at its best! 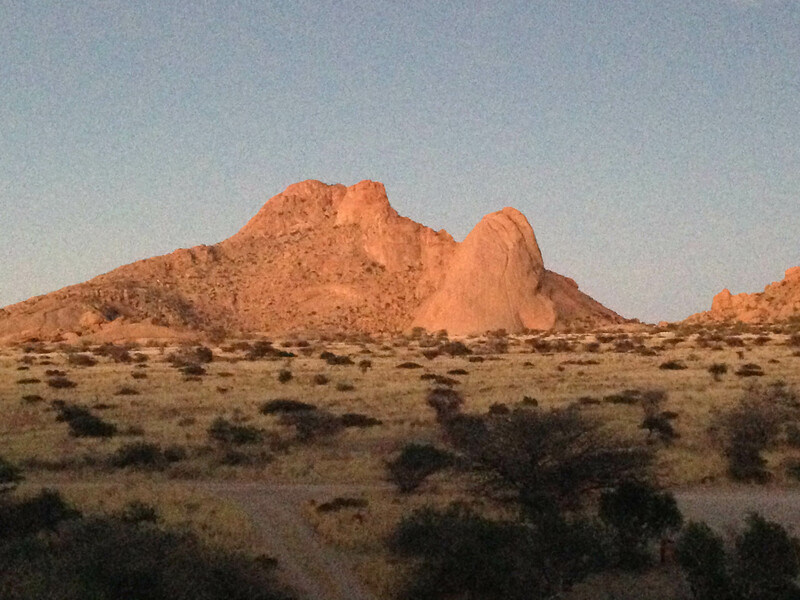 We were making our way to the one and only remote ‘bush camp’ of the trip, a place called ‘Spitzkoppe’, translated as “sharp head”, nicknamed “The Matterhorn of Africa”. 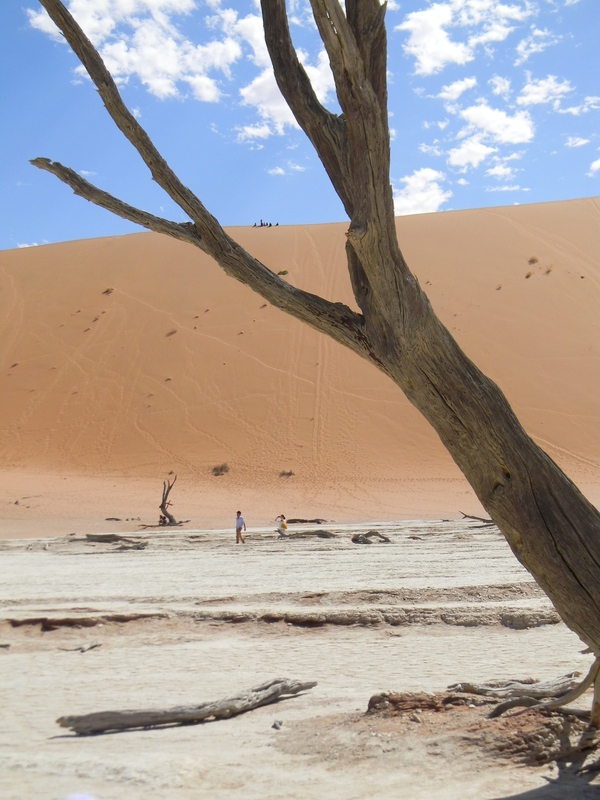 It’s one of Namibia’s most recognizable landmarks and as you will see from the pictures, absolutely stunning. This was by far our favorite part of the trip. This is what it looked like from afar. 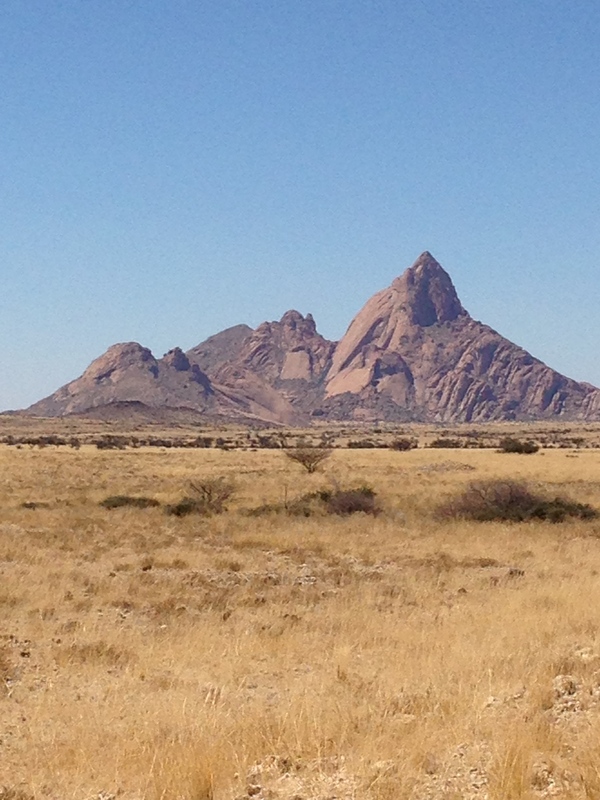 As we got closer and closer, we started to get an idea of the grandeur and size of these Spitkoppe Mountains. 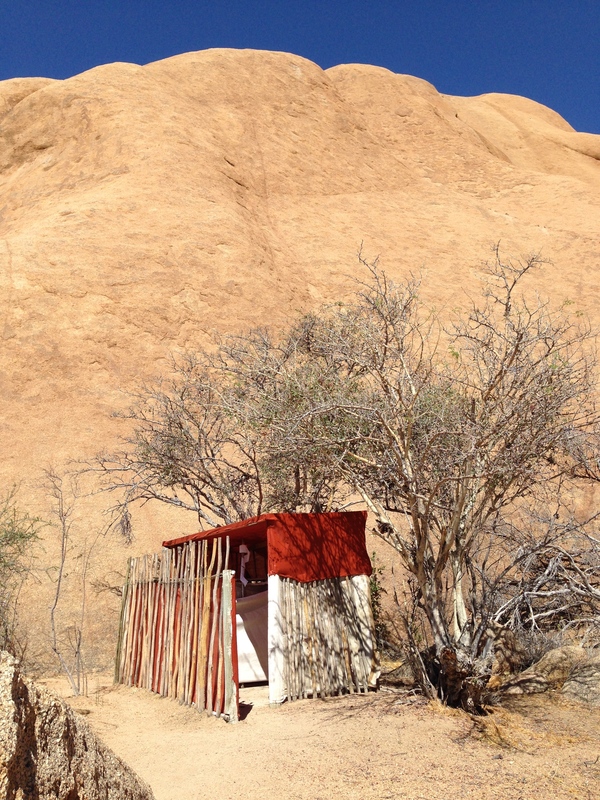 We arrived at our remote, “only place with a long-drop toilet” campsite. Our crew got busy organizing our camp; we got busy exploring. First, the camp. This is Richard setting up the first of our tents, always checking for shade and comfort. In the foreground you can see the acacia tree with its many weaver bird nests. Below – the long-drop toilet! In the shade, no less! 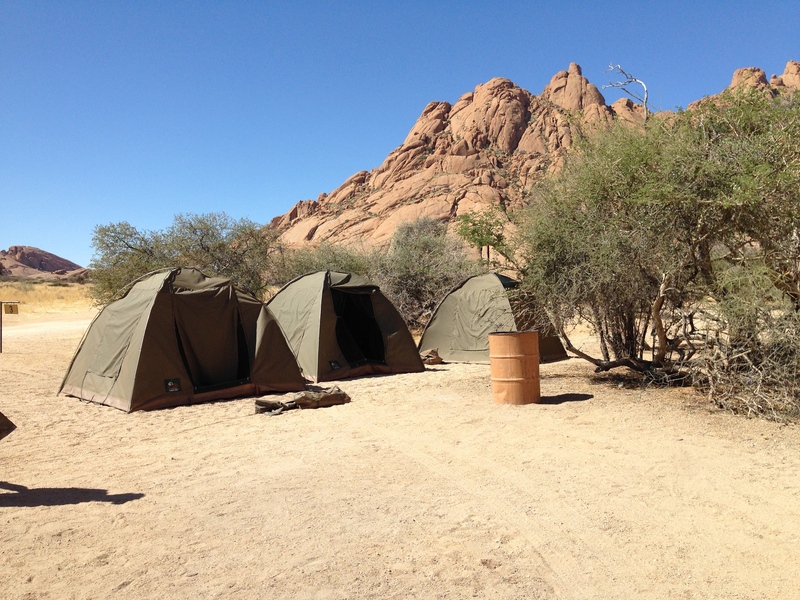 Our bush camp with the mountains as the backdrop. Absolutely spectacular! After exploring the camp and getting things ready for the evening routine, we set off to scramble around on the mountains. 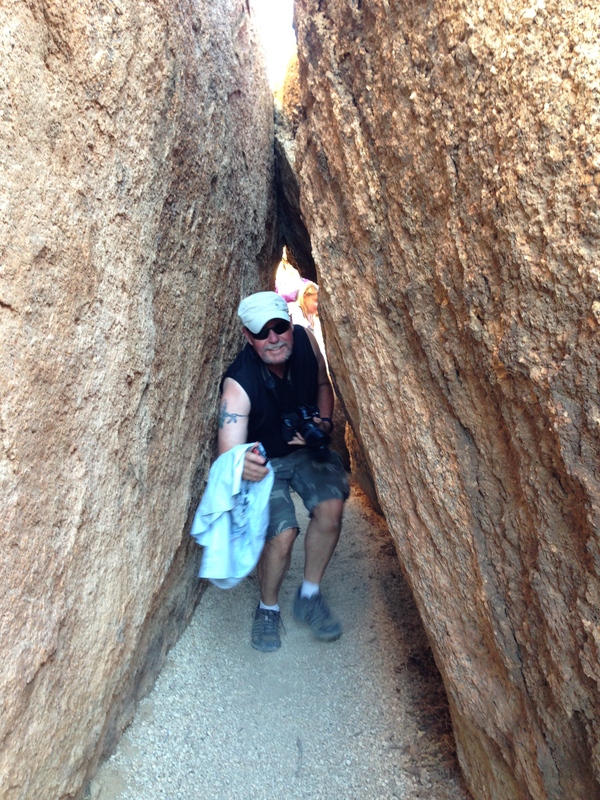 These big huge boulders were easy to climb up but higher than they appeared and very steep coming down. Below left, Mike & Jan “getting to the top”, right, the ‘Bush-babies’. 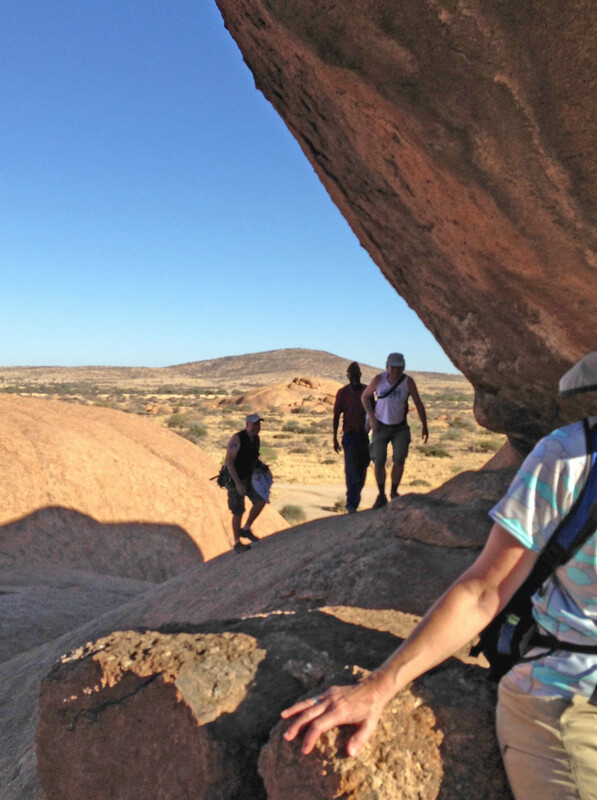 Next, we had a 2 hour walking tour scheduled with a local Damara guide who showed us the bushman paintings done with blood and ‘something something’, a bottle tree and finally ‘the bridge’. 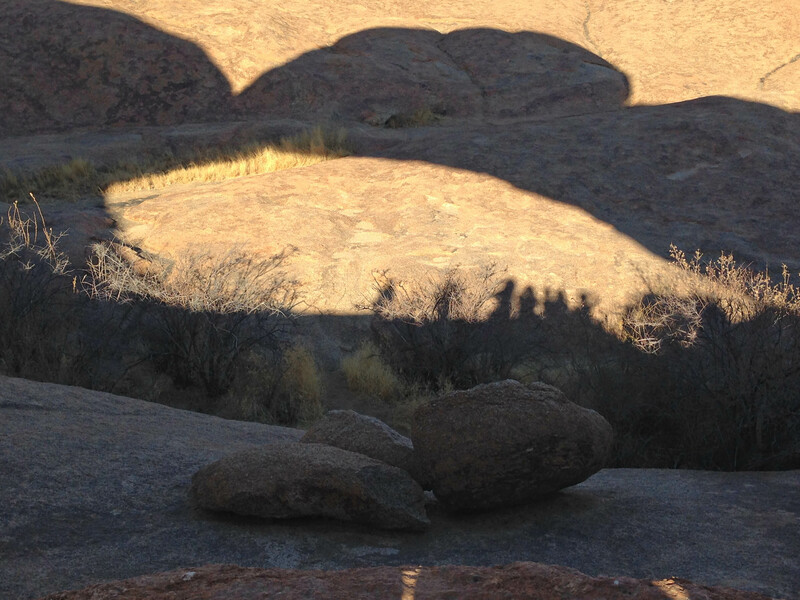 We made it to the top, right into the arch from where took a picture down, at Jan’s suggestion, of our shadows! 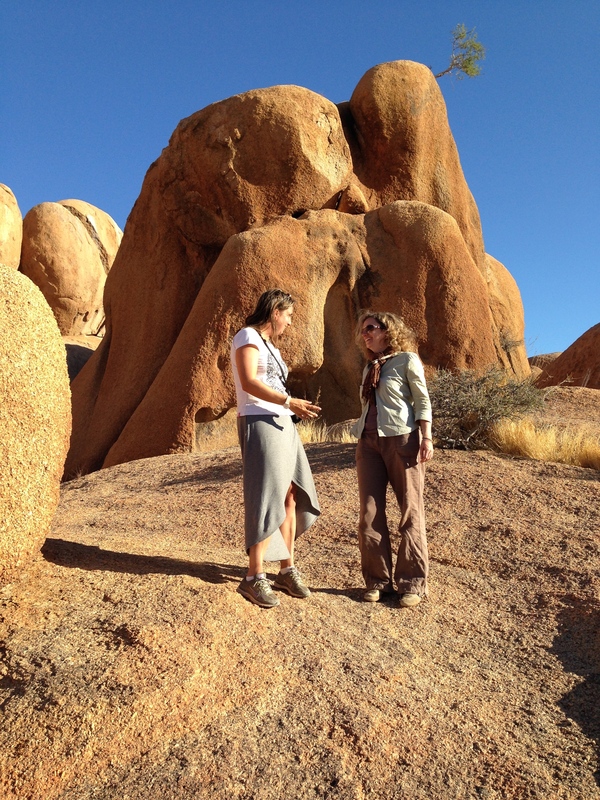 We continued our walk through the boulders and surrounding grasslands. 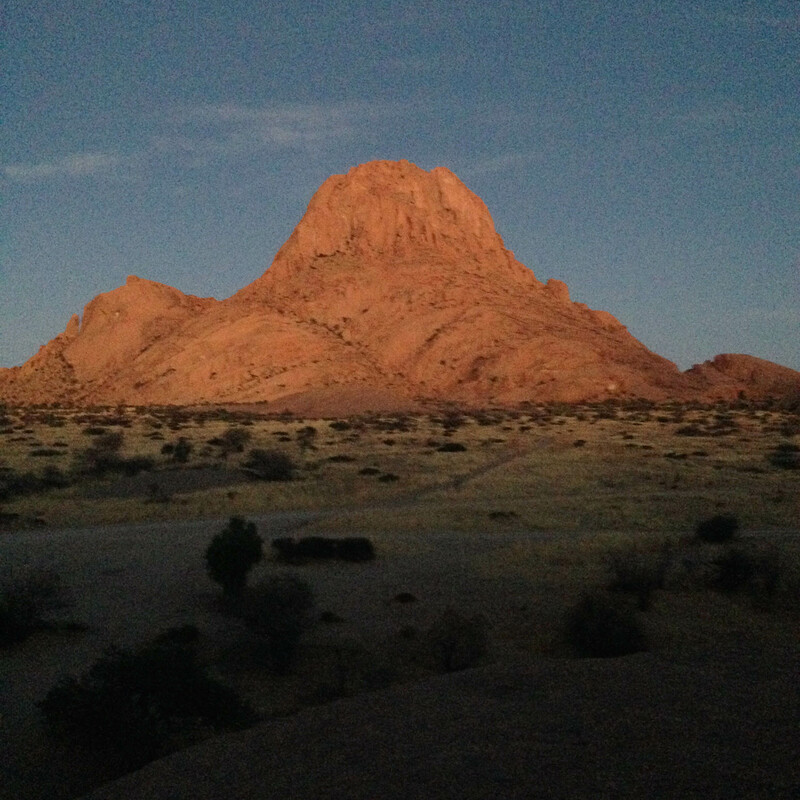 The sun was starting to set so up the mountain for sunset we went, each of us with a bottle of red or white in our arms. 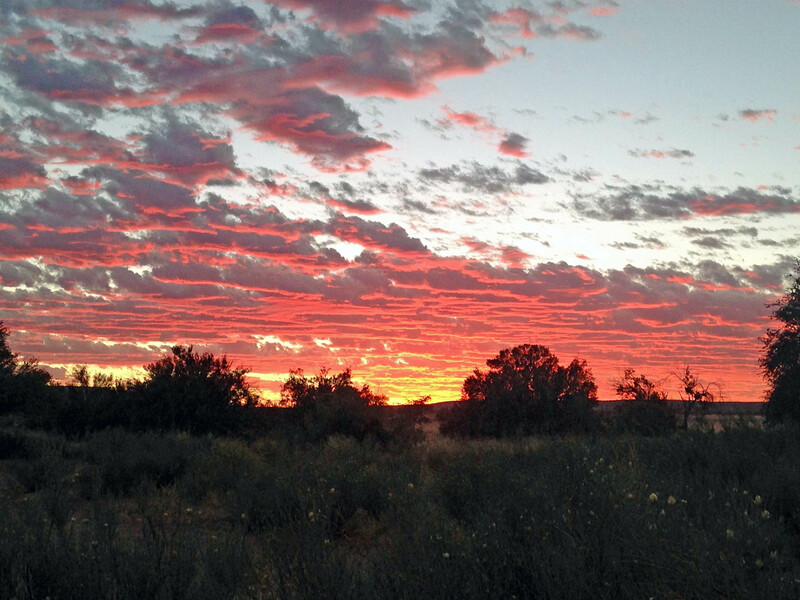 What a sunset and what a party! We all made it back down safely, believe it or not!! 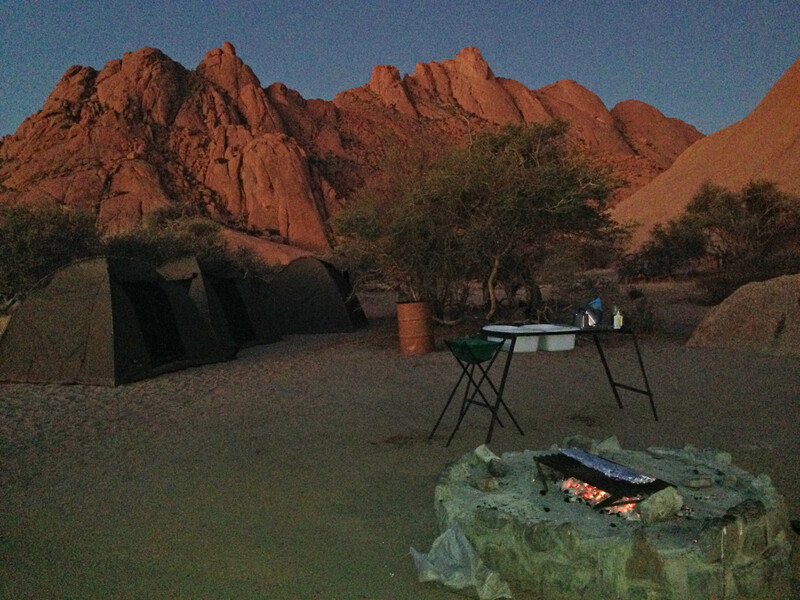 This is what our camp looked like in the evening. By the time we got down it was quite dark and our dinner was waiting for us. We had a dinner of fish (Snooke I think it was called, cooked in foil over the fire), an African version of scalloped potatoes, a rice dish, wine, all accompanied with lots of laughs and good conversation. 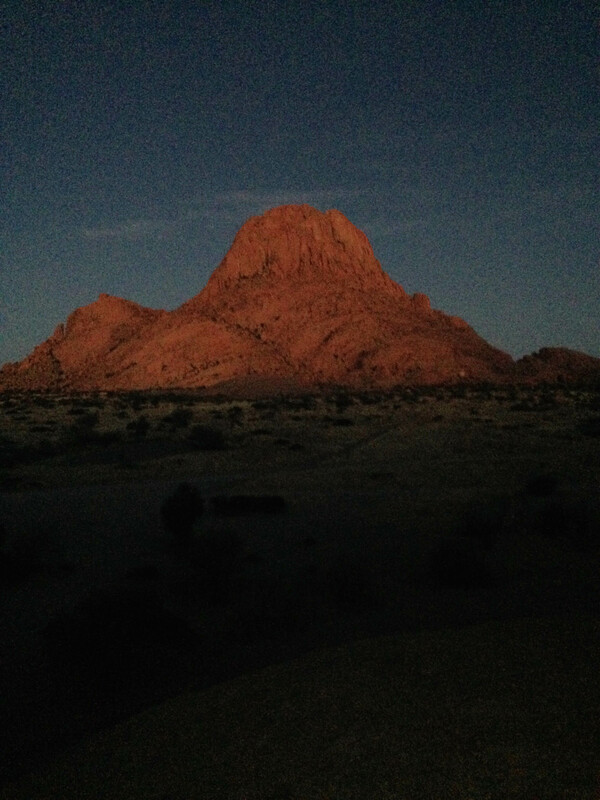 In this remote area without the reflection of lights, the display of stars overhead was brilliant. Mike stayed sitting outside for a long time, fascinated by stars, satellites, and shooting stars. It was early in the morning and once again, we were under way. It was a beautiful day, sunny and cool. 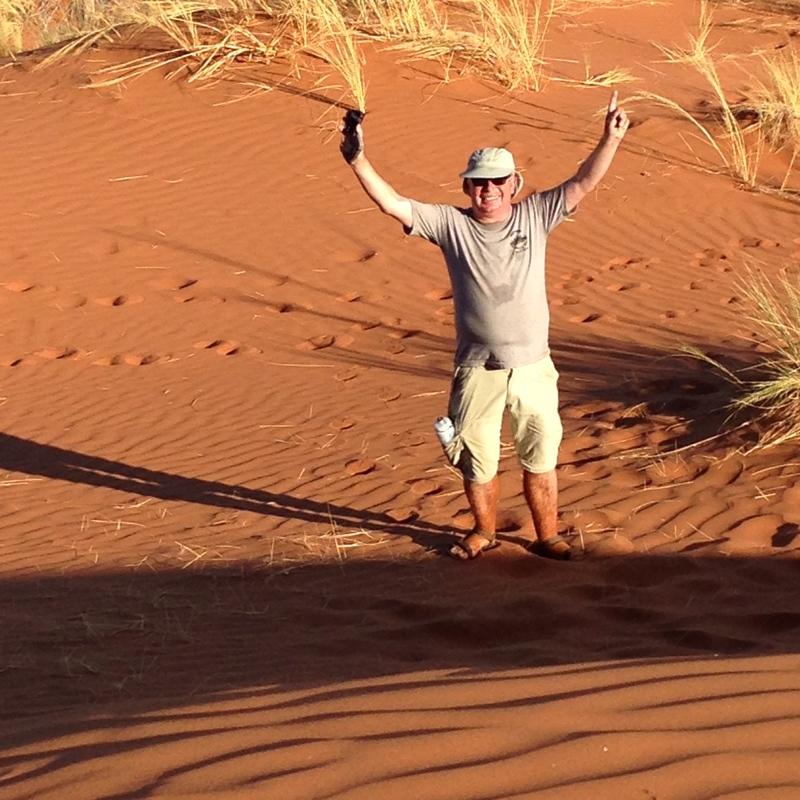 Leaving the Sossusvlei dunes camp was bittersweet ….. beautiful as the dunes were, I was happy to bid the fine red sand (that got into every tiny space), adieu. 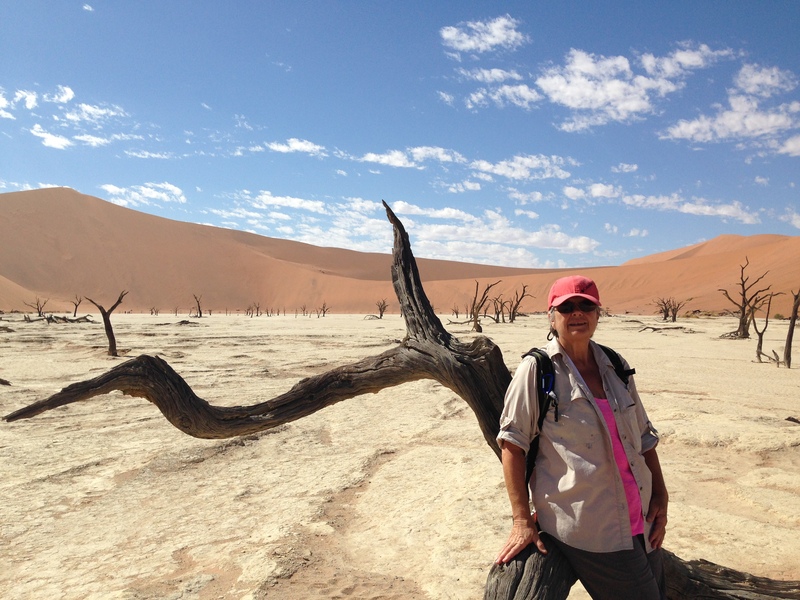 We were looking forward to seeing the flamingoes in the coastal town of Walvis Bay and almost equally interested in the larger, German- influenced town of Swakopmund; shopping and a night in a guesthouse – funny how one’s priorities can change. We stopped early into the day’s journey at Soltaire for “the best apple pie in Africa” according to Richard. Since my clothes were getting tighter and tighter every day, I declined. Thoughts of artwork ….. sitting on the bus, taking in the landscapes, thoughts of art projects filled my mind. I saw such a variety of greens blending together. I saw dunes of every hue, tone, and shade in the red – orange – yellow range and visualized myself using chalk pastels – smoothing a swathe of red and adding greens. I thought of all the abstracts I could make based on patterns taken from nature. 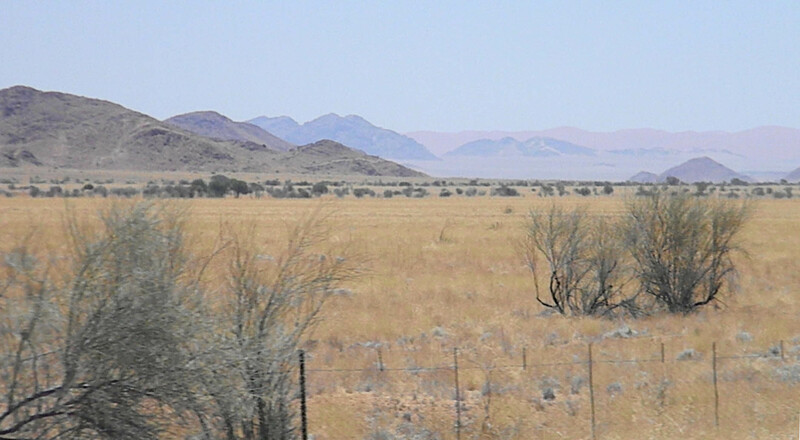 It was around 11 am and this was the landscape I was seeing. We were about an hour SE of Walvis Bay and the ocean. It was getting much cooler too … 22 degrees. 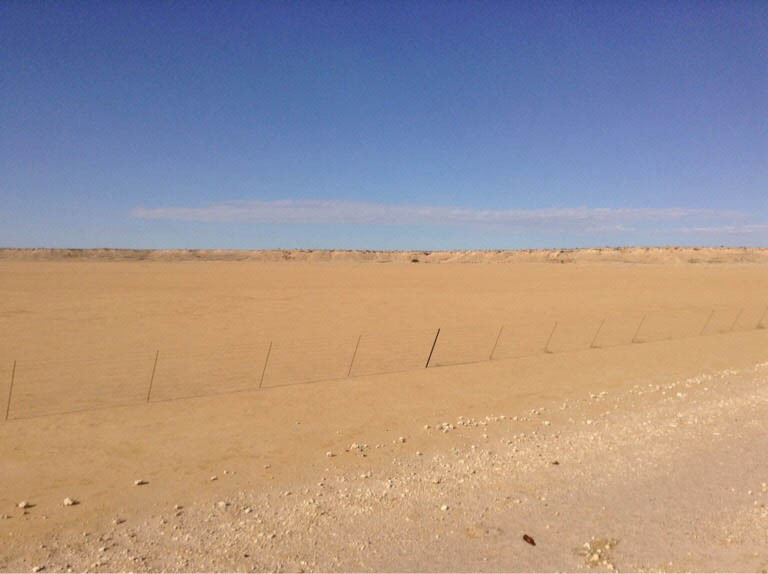 Finally we were closing in on Walvis Bay and I saw signs for “Dune 7”. I took some pics of what I thought was Dune 7. 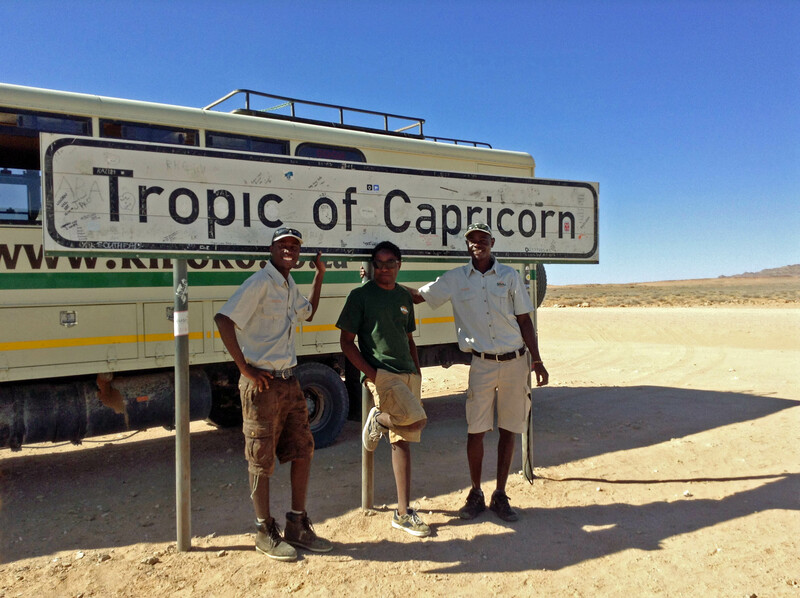 At this point, we crossed the Tropic of Capricorn and couldn’t resist the photo opportunities that presented themselves. We lunched beside the lagoon in Walvis Bay, treated to an ever-changing kaleidoscope of pink and black as the flamingoes took off and landed, almost continuously, on the ‘lagoon stage’ in front of us! 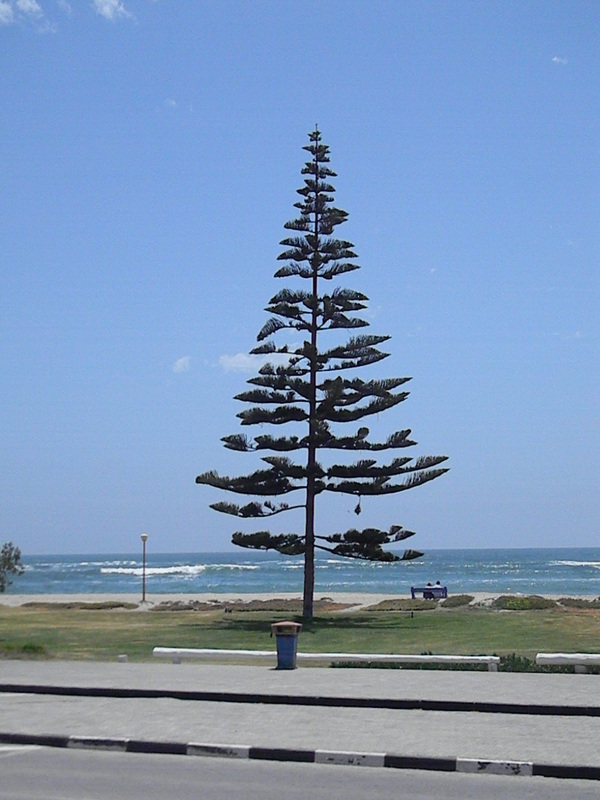 Entering Walvis Bay, I was fascinated by these trees, which we saw everywhere. I never did find out the name of them. 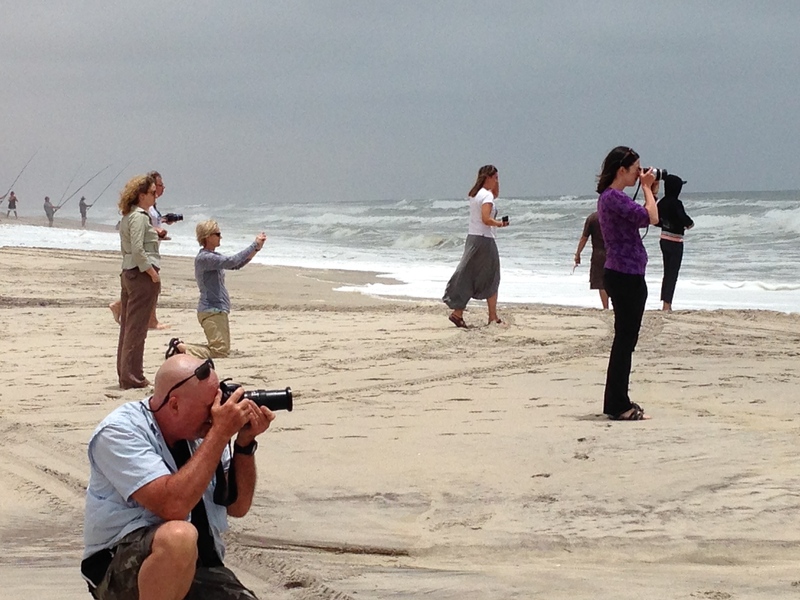 Here was our first sight of the Atlantic Ocean!! After lunch, we continued on our way, traveling north along the coast. It was only about another 30 km. 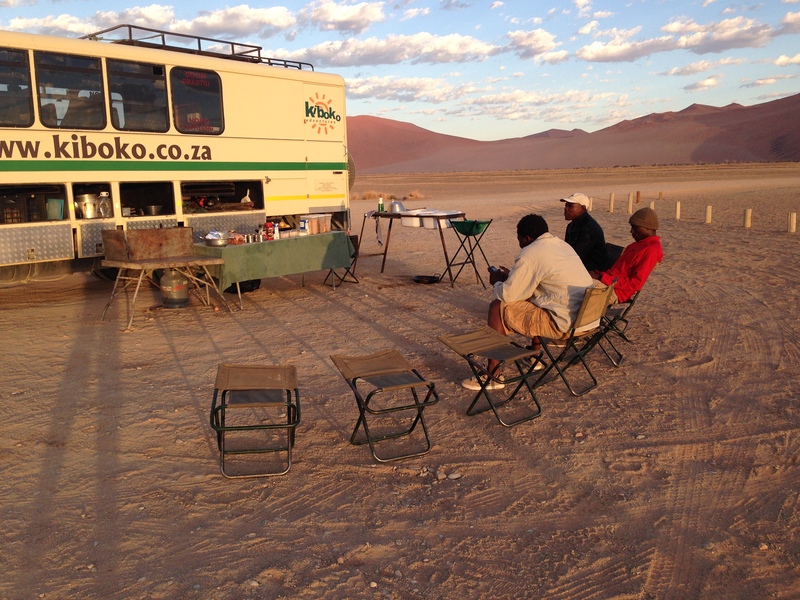 As we drove, we discussed the adventure opportunities available to us in Swakopmund and decided to take a township tour followed by dinner at a local eatery called “The Tug” recommended by our Kiboko crew. Dumi made reservations for both the township tour at 4 and dinner at the Tug at 730 pm. 12,000 people are living in the township which is called the DRC (District Resettlement Colony if I remember correctly). 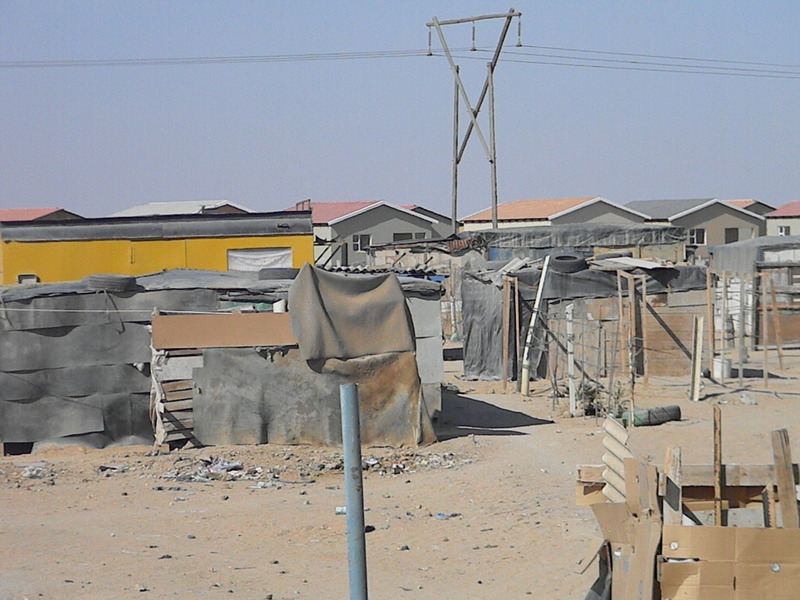 The township is basically a shantytown with no electricity or water. 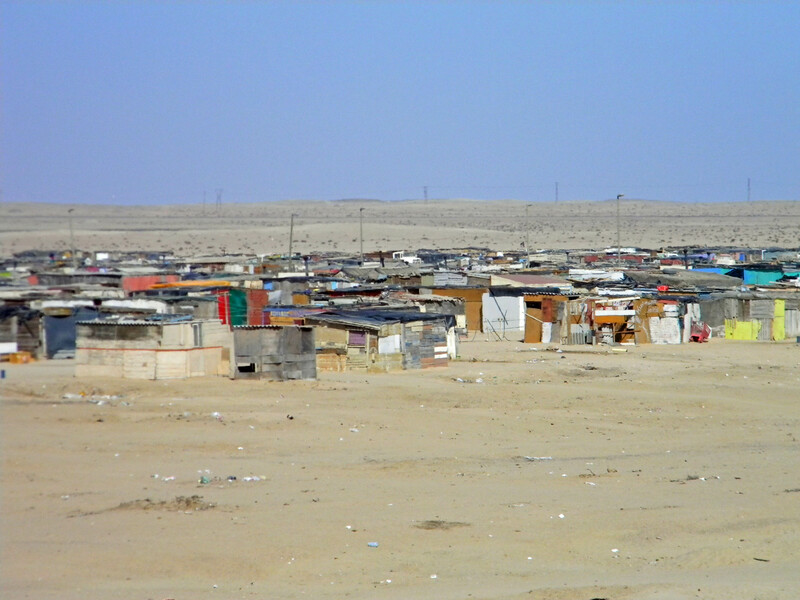 People spend most of the day outside, using their “shanties” only for sleeping in. 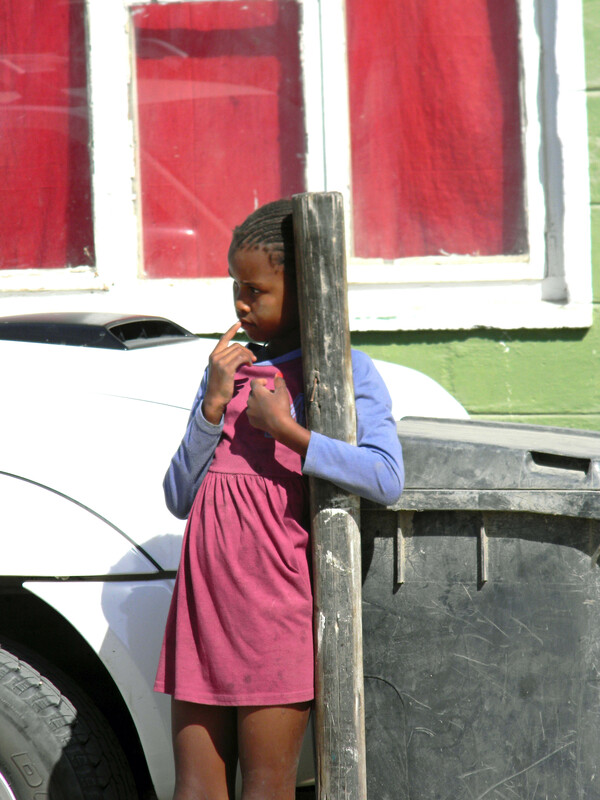 During the apartheid regime, blacks were separated according to their tribes: Ovamba, Damara, and Nama. 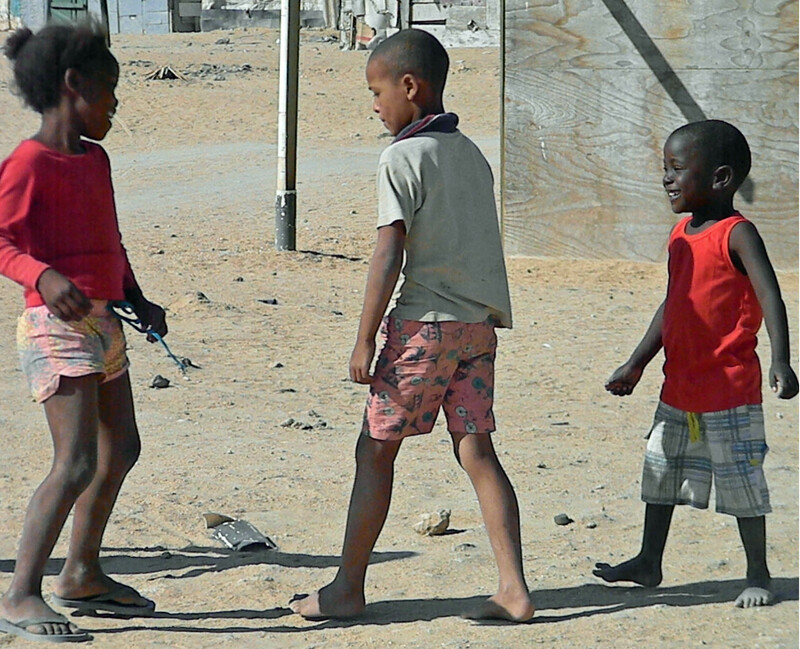 They all lived in the township but were kept separated. 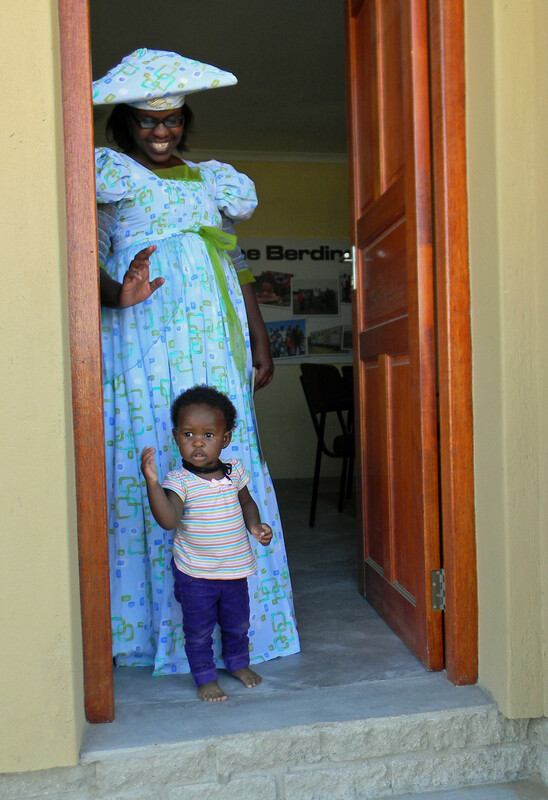 After apartheid was dismantled, many stayed living there – building bigger houses – it had become home. 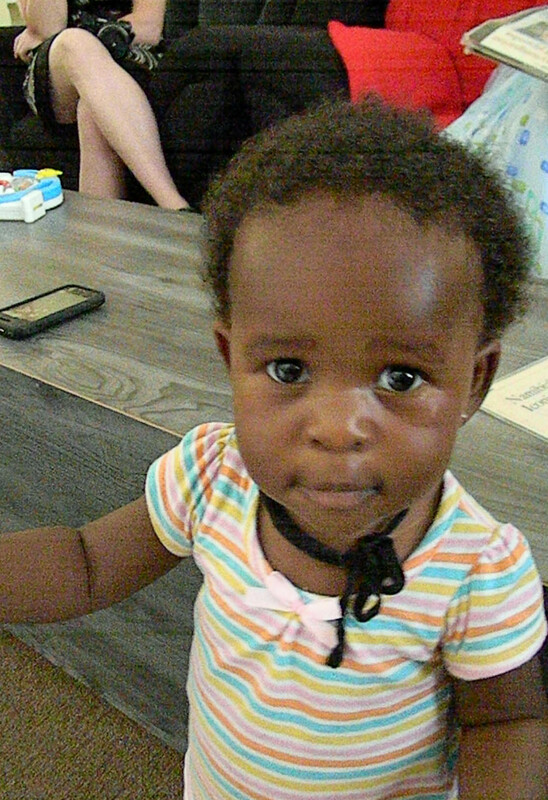 When we got to the township, we walked along a few of the unpaved streets, where Nadi was greeted by everyone we met. He was very specific about where we should and shouldn’t walk and when it was or wasn’t appropriate to take photos. Some of the best subjects were the kids. 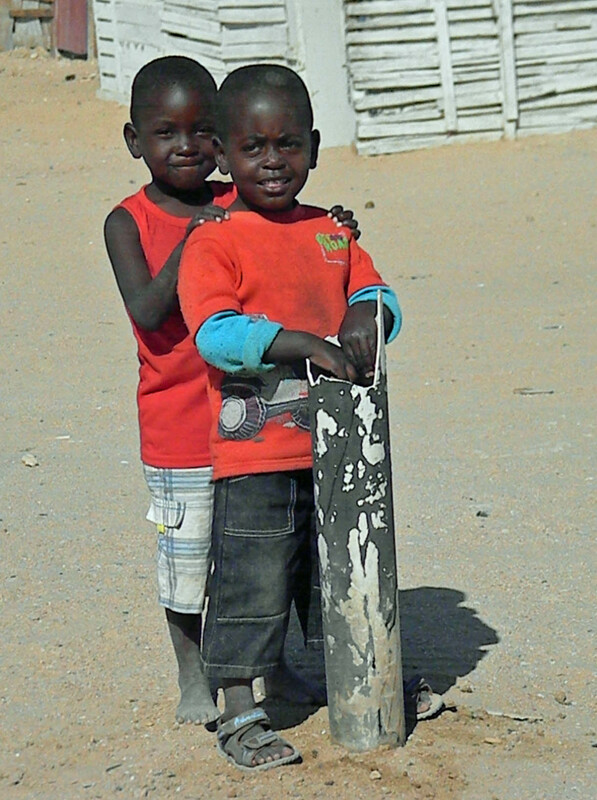 They were as fascinated with us as we with them and happily posed for us. After our walk and initial introduction to the township and what we were seeing, Nadi took us to visit a an orphanage in the township. 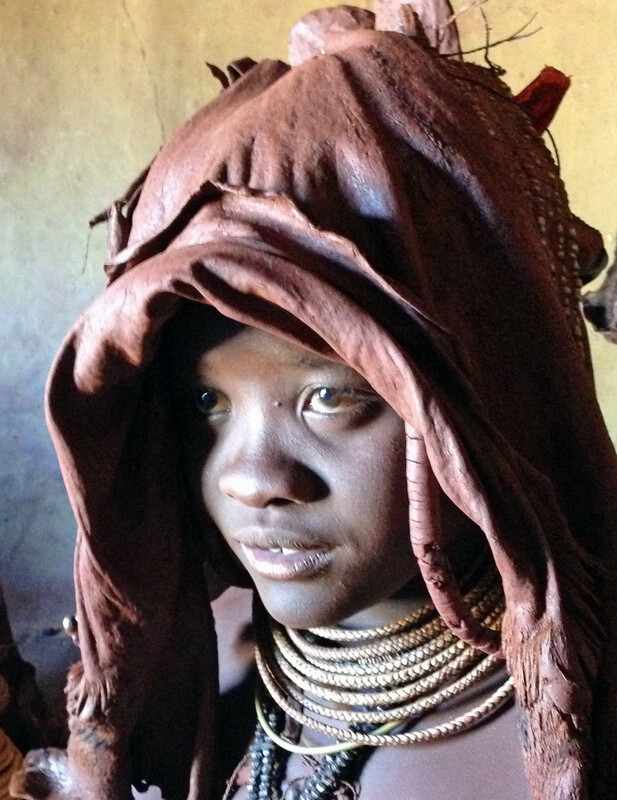 The woman we met there was of the Herero tribe; she was in full Hereo dress, characterized most by the horn-shaped head cover resembling the horns of a cow. 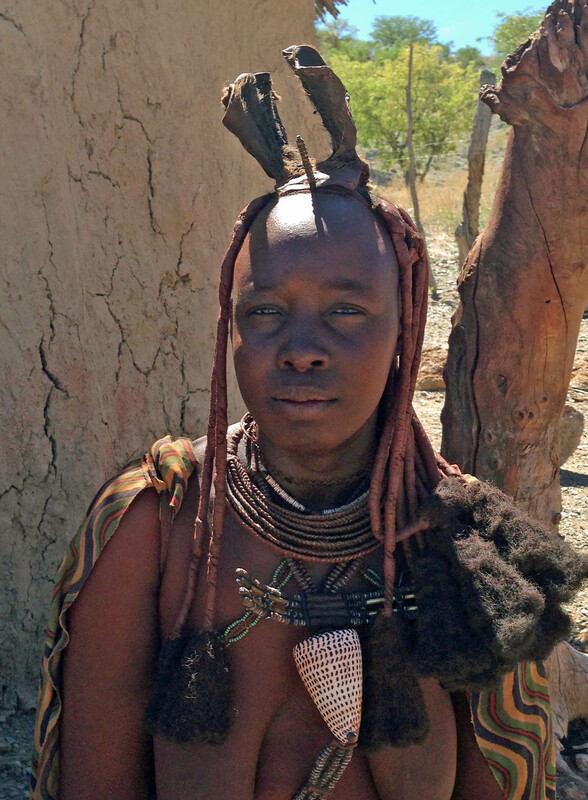 (The Herero people measure their wealth in cattle, as do many other African people, and this is evident in the women’s traditional way of dress.) She had the sweetest toddler with her – I couldn’t resist snapping a few photos, hoping to get a good enough one to draw from. There were no there children that we could see – the other children were all off on some outing, I believe. Our next stop was a local craft shop, supporting crafts made by women from the township where we bought a few crafts …. for us that meant baby clothes for Mike’s eagerly anticipated first grandchild. 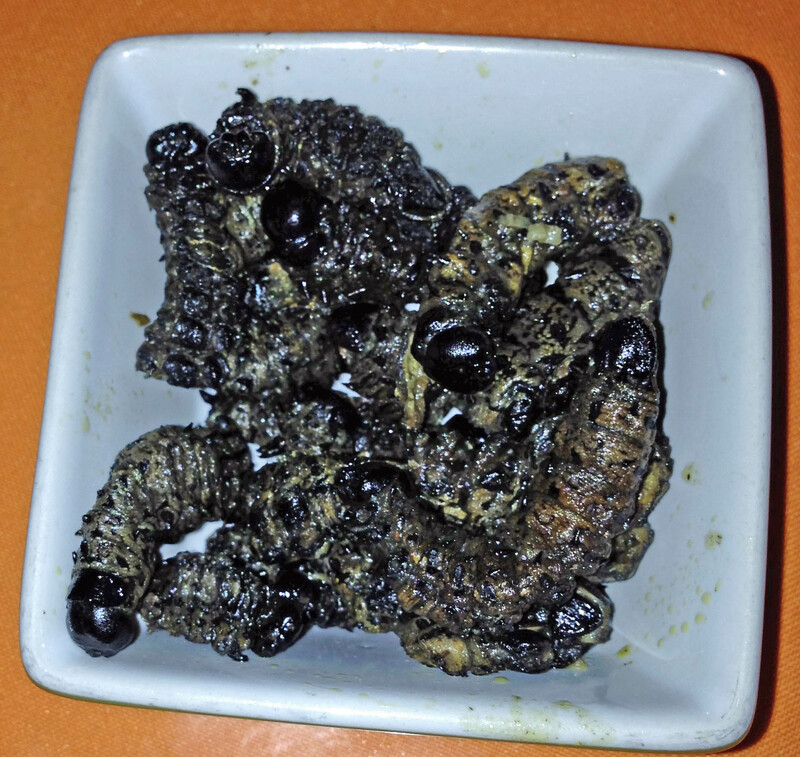 Our last stop was the most highly anticipated one – a local restaurant where we sampled the local fare: spinach, pap (a traditional porridge made from ground maize, a staple of the Bantu people of South Africa), chicken, a kind of bean mush, and Mopani worms. In the food department, I was definitely not the most adventurous of our group. I didn’t eat anything but the chicken. 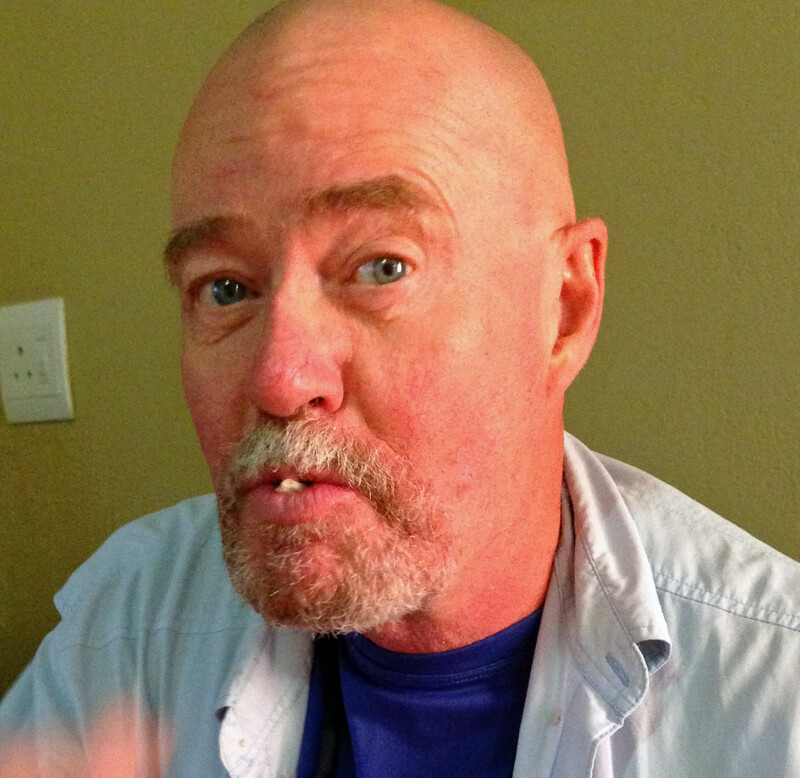 I tried the spinach but it was terribly gritty, the beans …. 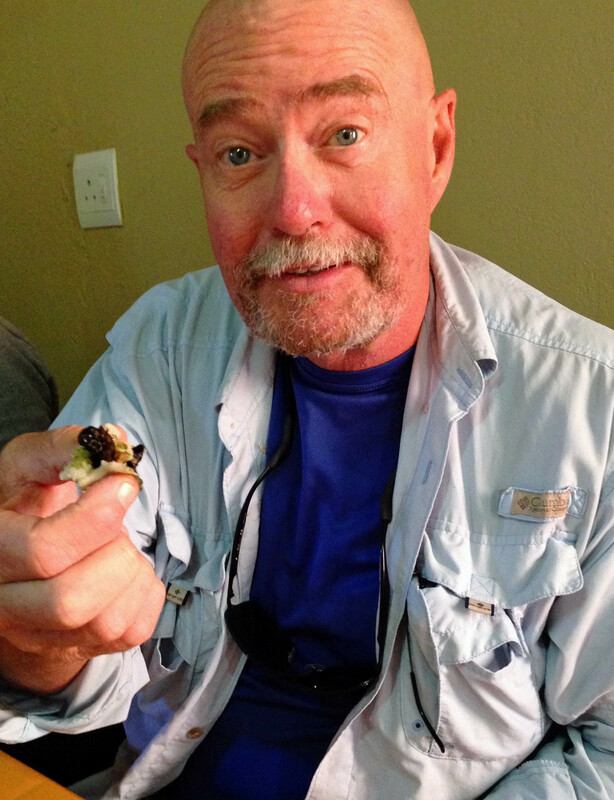 I didn’t like the taste of and the mopani worms …. I could hardly look at them, let alone eat them. It was hard enough taking a picture of Mike putting one in his mouth and chewing it!!! Hmmm ….. ! Do you think he liked them?? Afterwards, Dumi explained to us that there are different ways of preparing the worms and that the ones he likes are deep fried. We had another chance to try them that way and then Mike liked them better. 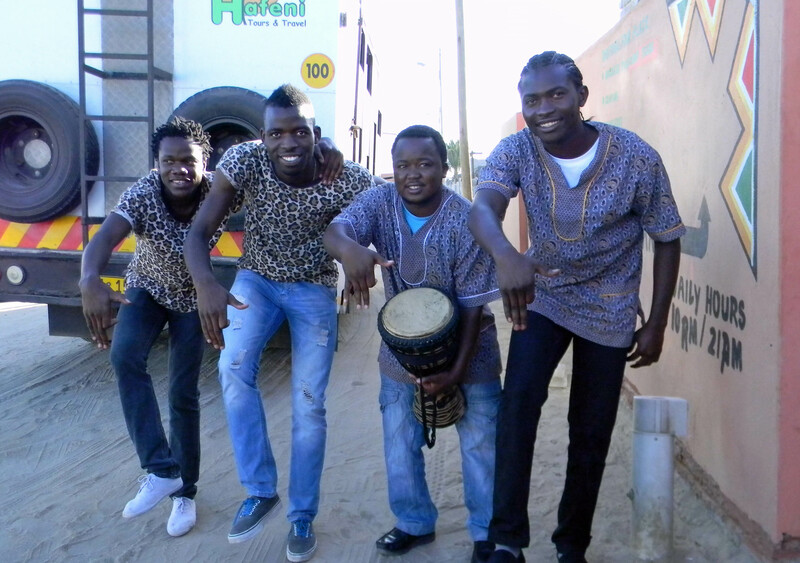 After we had eaten our fill, we were serenaded by a local African apace vocals group. They were a group of 4 guys and not only was their music great, their energy was fantastic. They pulled a few of us up to dance and share in their fun and love of life. In this next photo of them, you can see each of them making a gesture with their hand …. 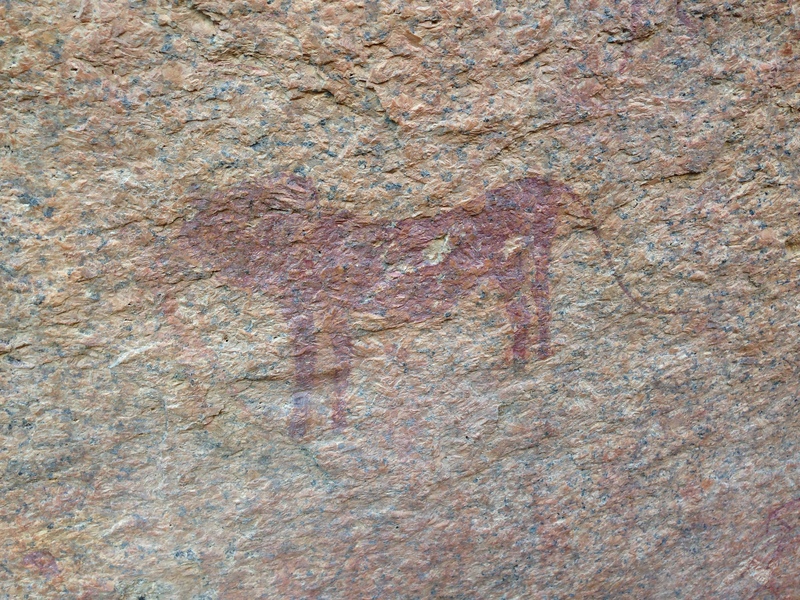 it is the symbol of Namibia, in the shape of their country. The thumb sticking our horizontally represents the Caprivi Strip, the small strip of land along the northern border between Namibia and Angola, extending westwards from Namibia into Zimbabwe in the north and Botswana in the south. A great ending to a great township tour. We bid Nadi farewell and went to our respective rooms for “comfort” stops – a shower and a snooze and after a while, set off to find ‘The Tug’ restaurant at the jetty. It was packed and looked like a the recommendation was well-deserved. However, it wasn’t meant to be. Although a reservation had been made for us, somehow, the restaurant had no record of it. Apologetically and and most helpfully, they sent us off to Kuchhie’s, also highly recommended. We sat at a long trestle-like table and ordered a variety of dishes ranging from a gourmet burger to a dinner of wild game meats served with ….. the ever – present wine and beer of course. In the middle of pre-dinner drinks, who should appear but Dumi and Richard. Originally, their intention was to find us at The Tug but ended up on a kind of treasure hunt, eventually finding us at Kuchie’s. Our invitation to “join us” was accepted and the evening progressed in fine style from that point the ‘young and the beautiful’ of our group, renamed “The Bush-Babies”, and Jan (our Dutch Dancer) went in search of the local nightlife. (Not sure f they found the ‘nightlife’ or became it!!! The older and wiser of the group, Mike, Rhea and I, wandered home and trundled off to sleep. 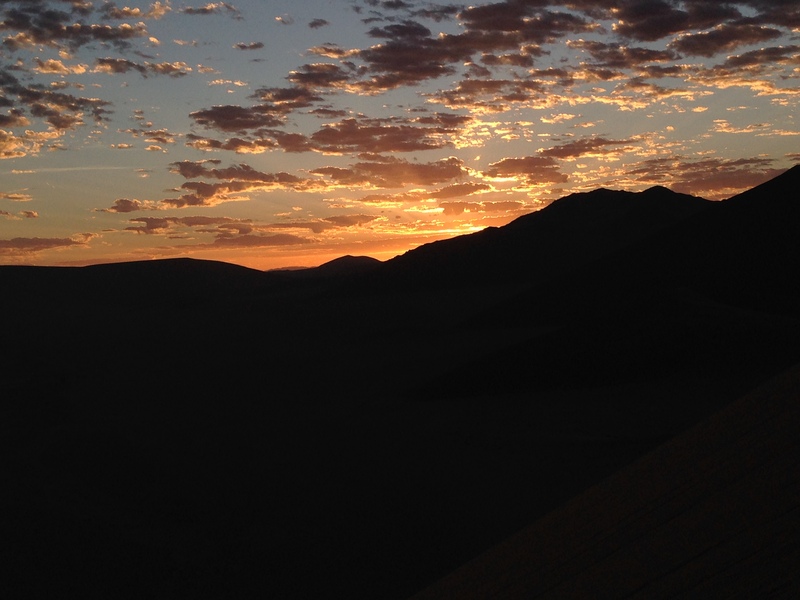 Up very early at 430 and on the road to Dune 45 before breakfast to catch the sunrise from the top of the dune. Mike, feeling rough with the effects of his cold, didn’t climb with us, opting instead to take pics from below. 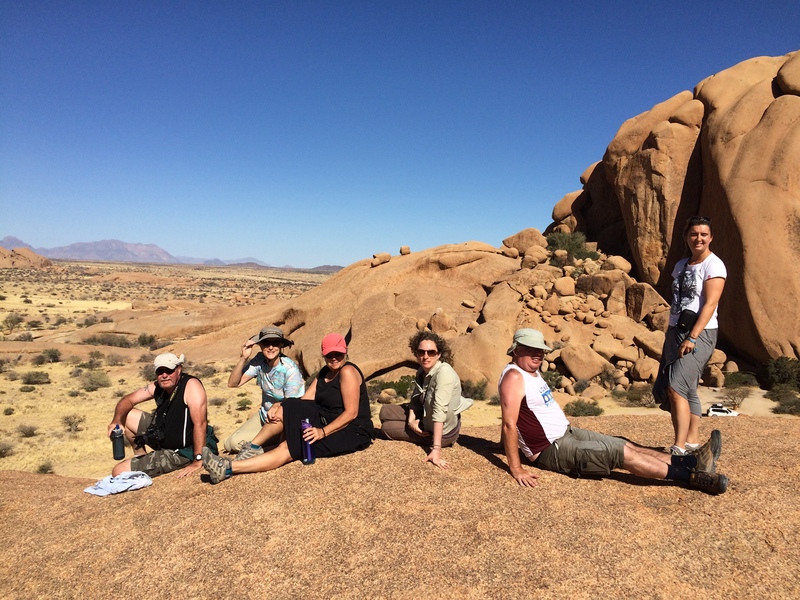 We climbed …. 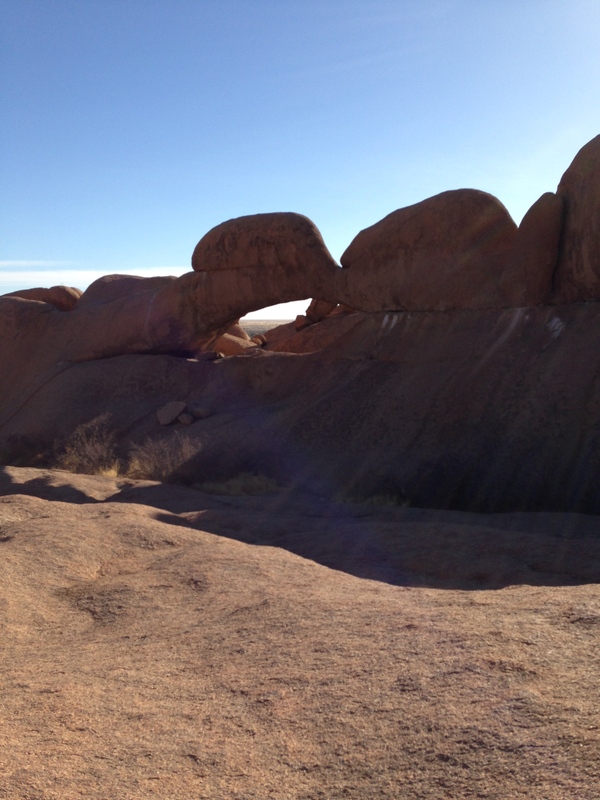 and we climbed ….. rested …… and then we climbed some more. Finally, when we couldn’t go any farther, we just plopped ourselves down in the sand and enjoyed each other’s company until, in awe, we witnessed the rising of the sun in silent splendor. As the sun continued to rise, the light became good enough for a selfie or two which turned into a selfie flood. 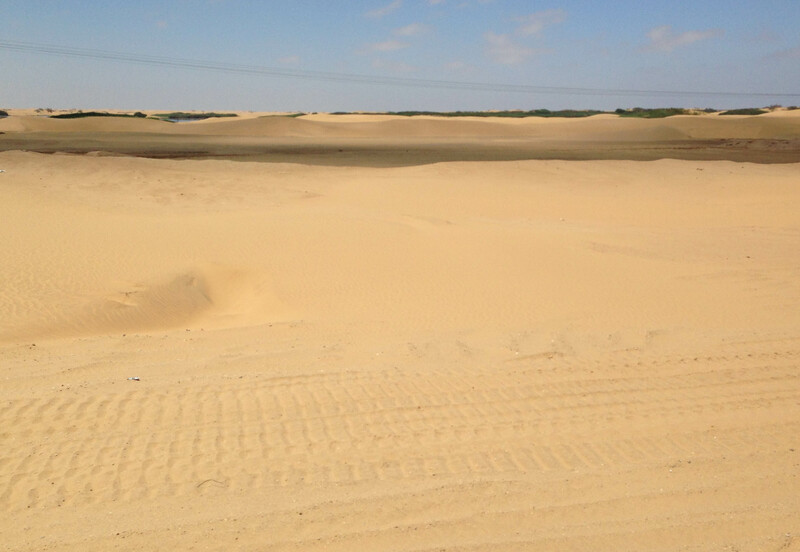 Here are just a few of the pics I took from both top and bottom of the dune. Panorama from the top of Dune 45, looking down, framed by Claire on the right, Rachel on the left, and our crew below. 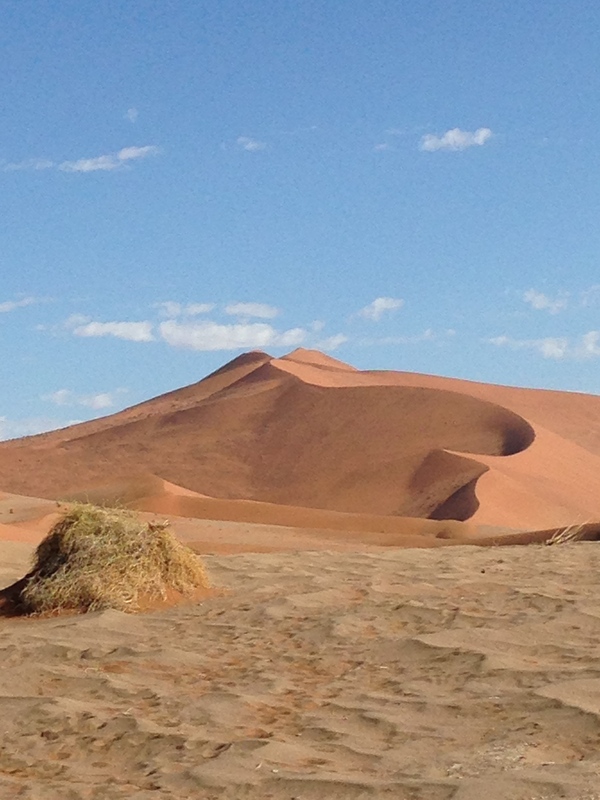 Panorama shot from the bottom of Dune 45, looking up. 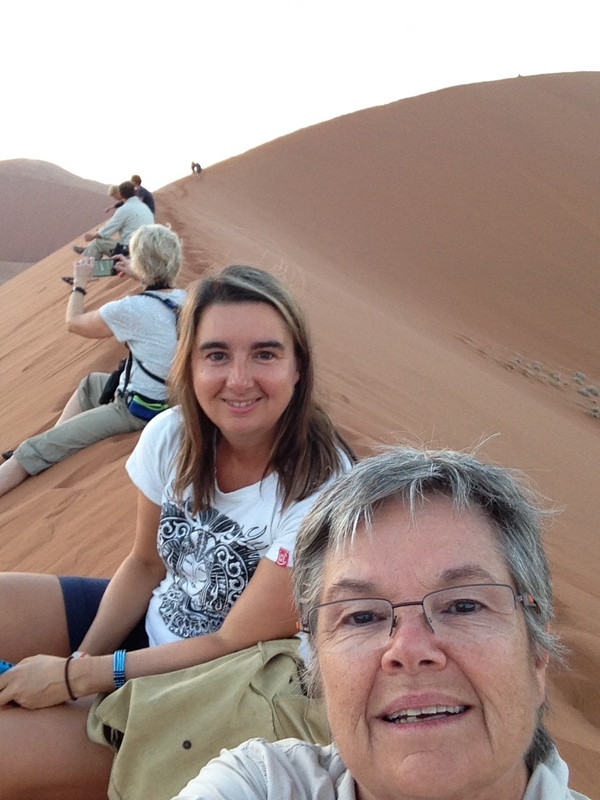 Ran down the face of the dune, creating little mini-sand-slides as we went, supervised by an oryx below who wasn’t too concerned (probably came to see the show from his perspective – crazy humans!). 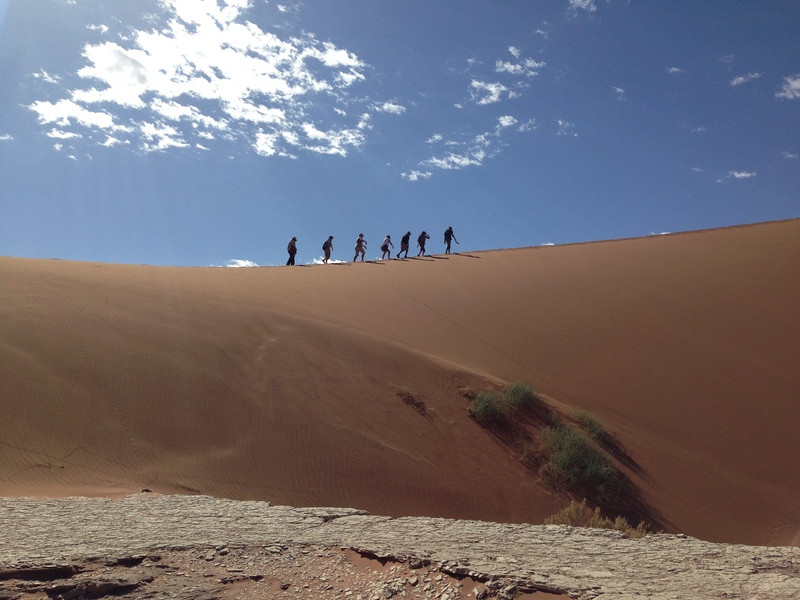 Our different styles of descending the dune. The guys were waiting for us with a big breakfast of french toast, coffee and the ever present rusks. Parting shots of Dune 45 and the ridge we climbed, as we left for the next challenge, Big Daddy Dune. Big Daddy Dune was indeed, BIG!! After breakfast we drove a few kilometres further and parked the bus. 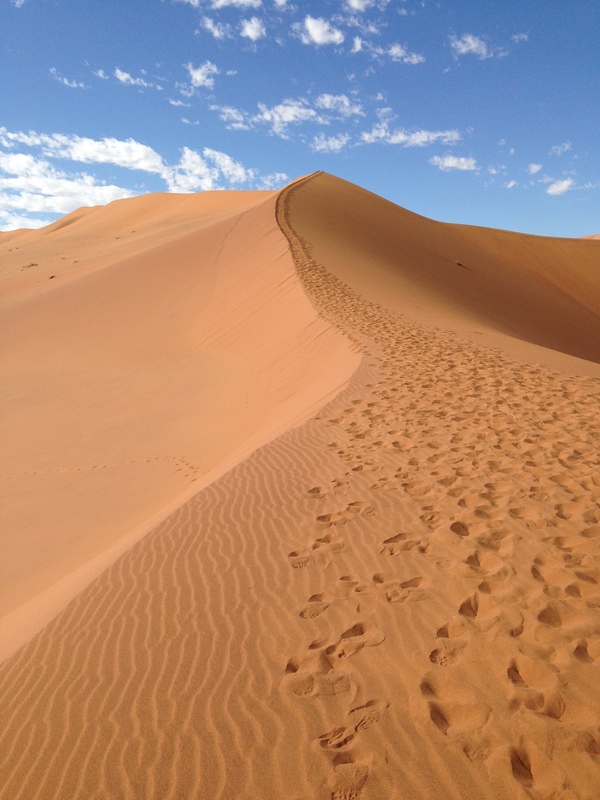 We set off walking cross country but parallel to a sand road much the same as what we drove on in the Wahiba Desert in Oman. 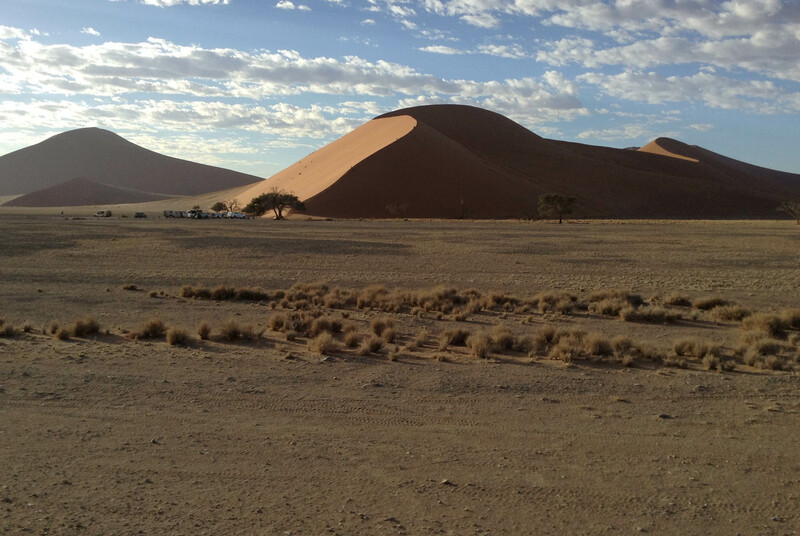 Rides in safari vehicles to the dune were on offer but we opted to walk the 5 kilometres to the dunes. 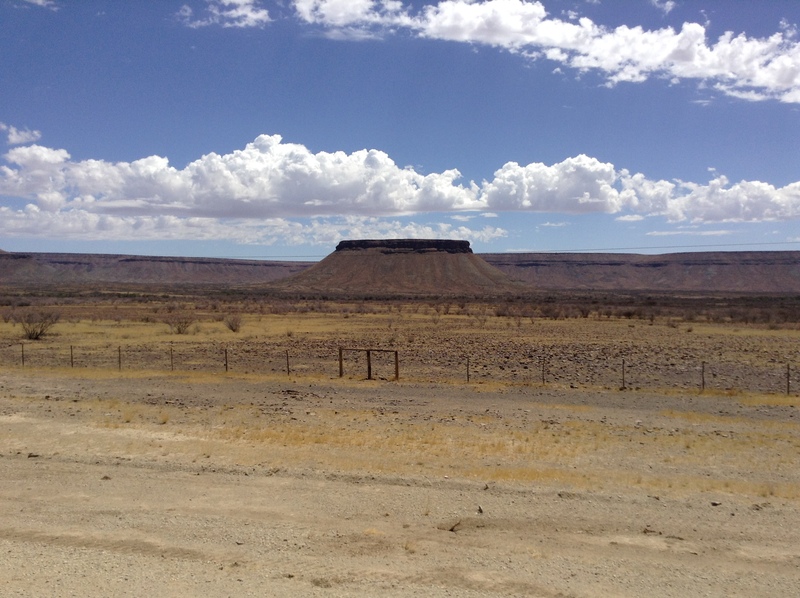 Here is some of the spectacular scenery we saw. 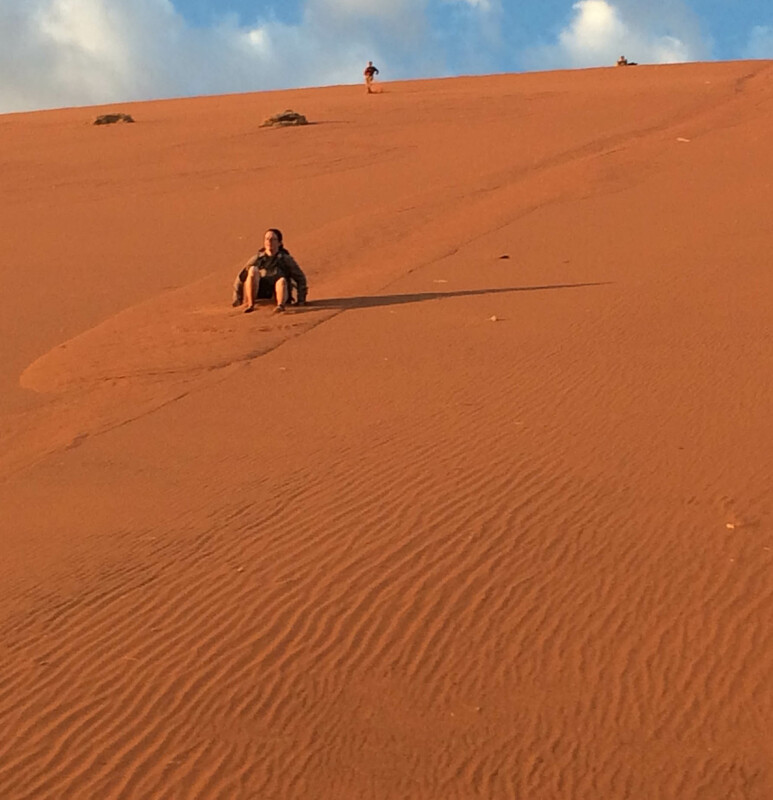 Mike and I had had enough of climbing the shifting red sand of the dunes and chose instead to skirt the edge of the dune and watch the others trudge their way to the top. 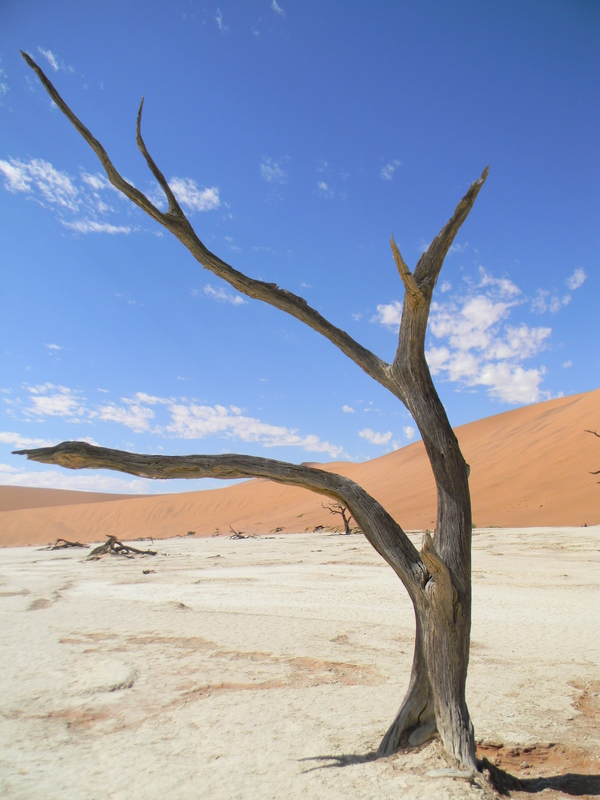 We took the lower altitude route around the base of the dunes to Deadvlei, a huge white salt pan with twisted, blackened, dead, acacia trees. 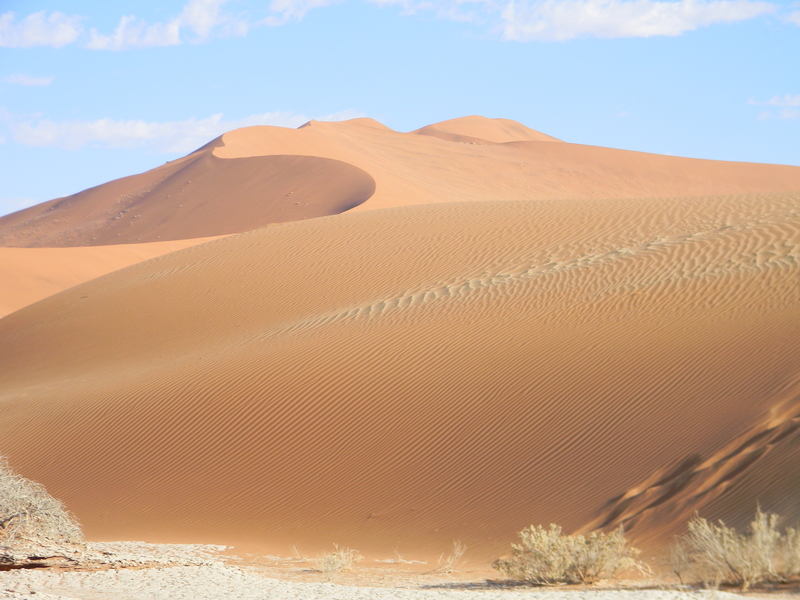 It made for some spectacular shots with the red dunes as a background and the blue sky above. 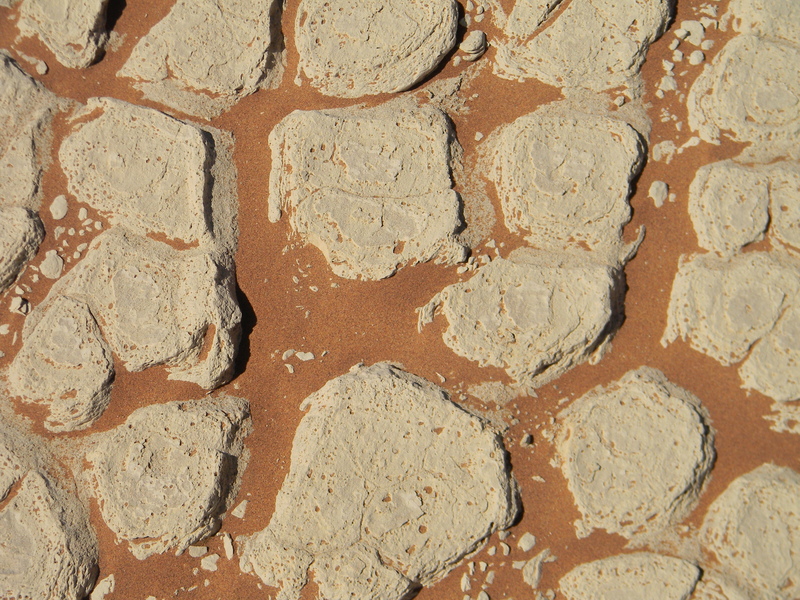 Saw some great abstract art in the sand/salt pan. We met these two women who were also visiting. We left to walk back to camp while the others came down, took pics and caught the shuttle back. It was a long walk back, and very hot but still, I enjoyed it. We walked over 10 km. 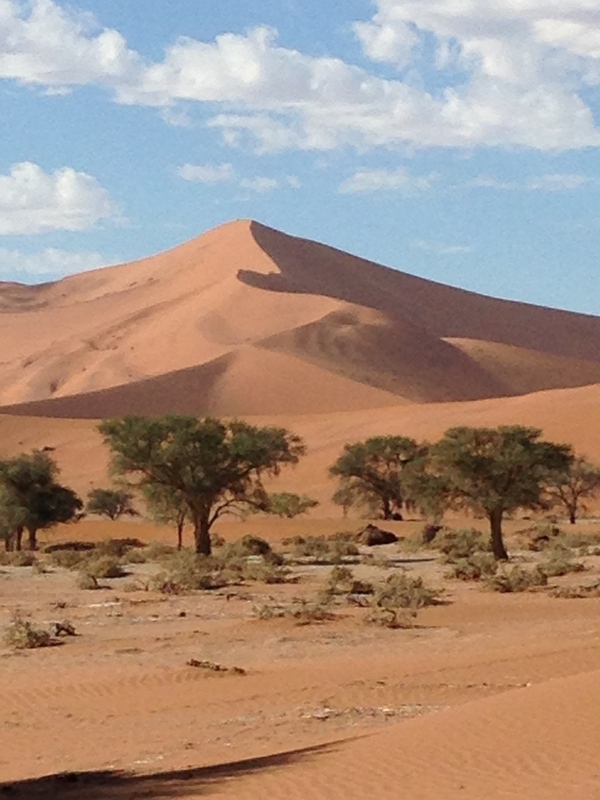 One last view of the most beautiful dunes in the world and then lunch where we were parked. Then, back to camp. We were all tired but our tents were in the full sun so we sat in the bar for a while sipping a beer and chatted, waiting for the shade to reach our tents so we could snooze. We didn’t feel the wind rising. 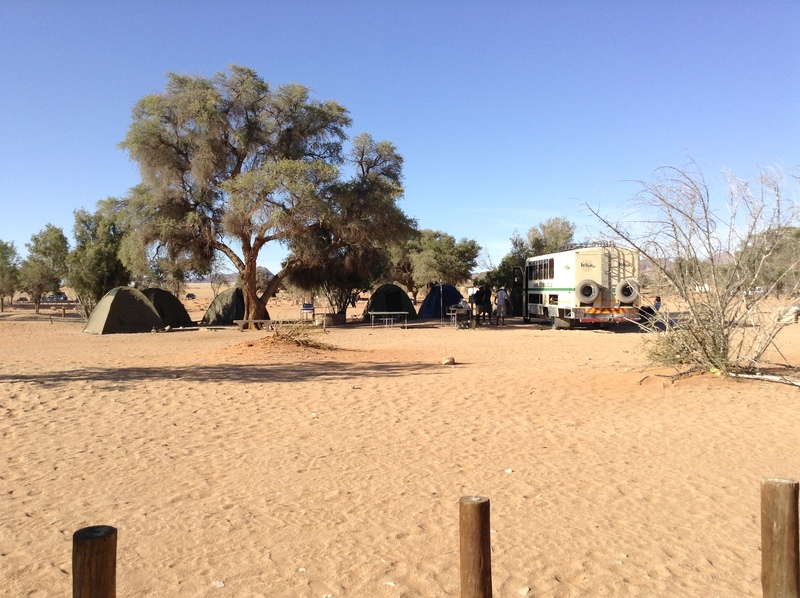 When we finally settled into our tents for a snooze, the wind gathered strength and before long, we were covered in a layer of fine sand. We closed up the tent and returned to the bar. 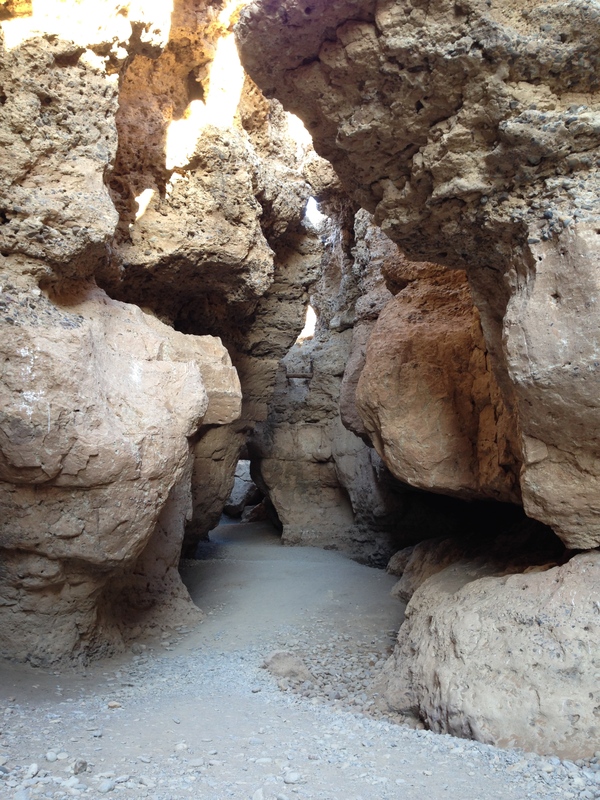 In the late afternoon, we walked into another canyon, Sesriem Canyon. Beautiful but too tired to appreciate it fully. Back to camp for a dinner of stir-fry beef and veggies with macaroni. 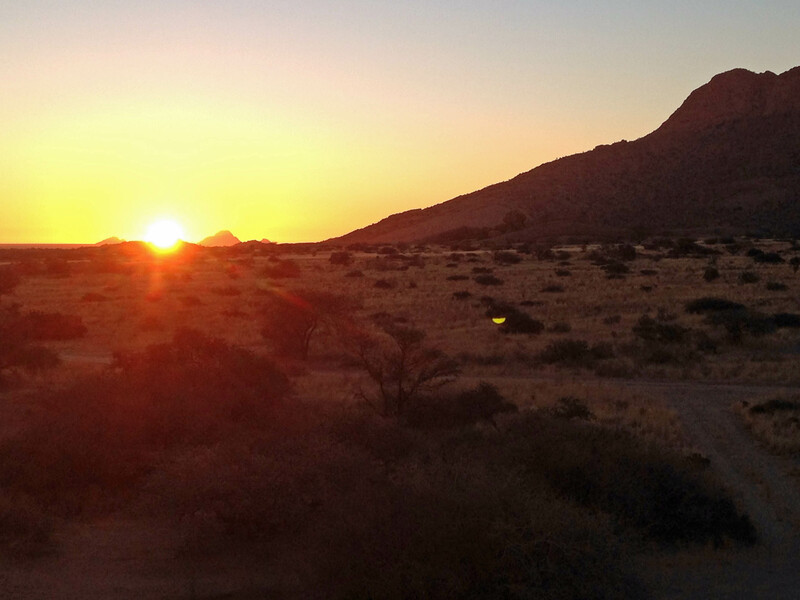 What a way to wake up – a beautiful sunrise enjoyed sitting just inside the door of the tent. We were on the road by 7 am. On the bus this morning, before we started driving, Rachel took out one of her bags of chips and commented that we’d better eat them before they turned into crumbs (referring to having carried them around for so long). Mike said, “Then we can snort Simba dust “. Rachel replied, “Yah, riding the Africa lion”! We had a good giggle. 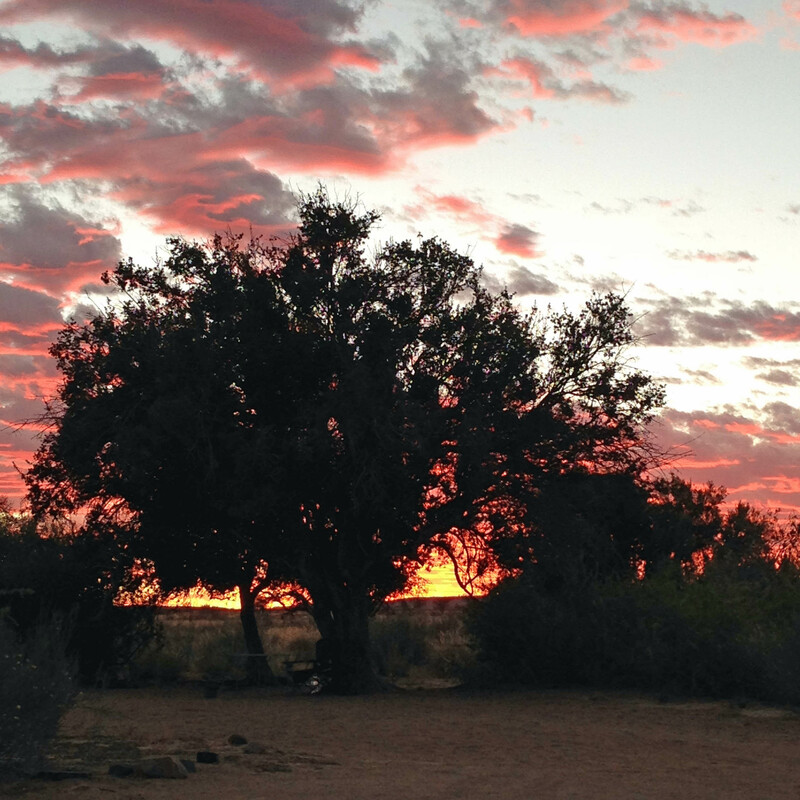 A great sunrise and lots of laughter – could life be any better? 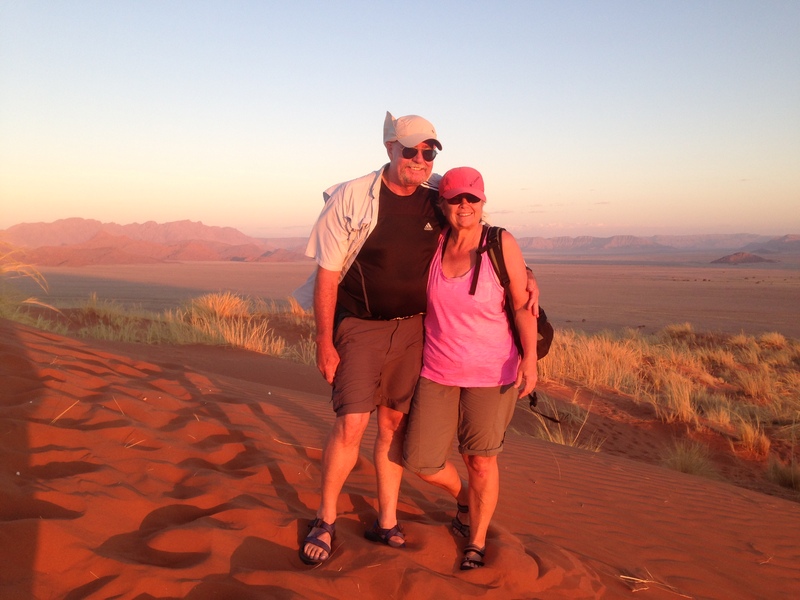 We were heading to Sessriem, to a campsite located on the edge of the Namib Desert, (one of the world’s oldest deserts) a distance of over 500 km so we had a full day ahead of us. 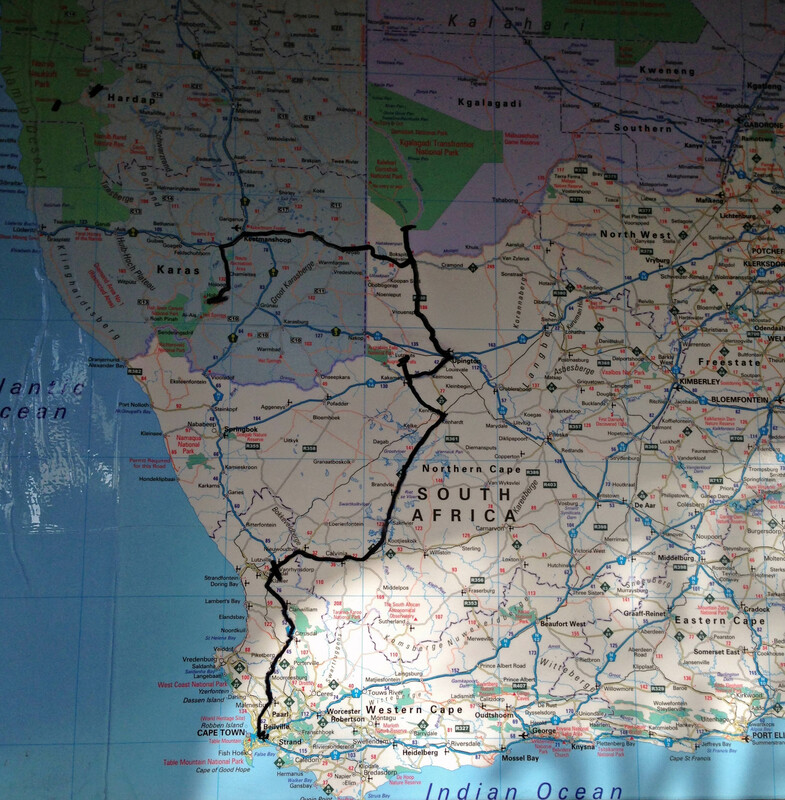 Below is a map of our route so far this trip. This laminated map was at the back of the bus. Everyday, one of our crew members would trace out our route but this day was the first day that I thought to take a picture of it. 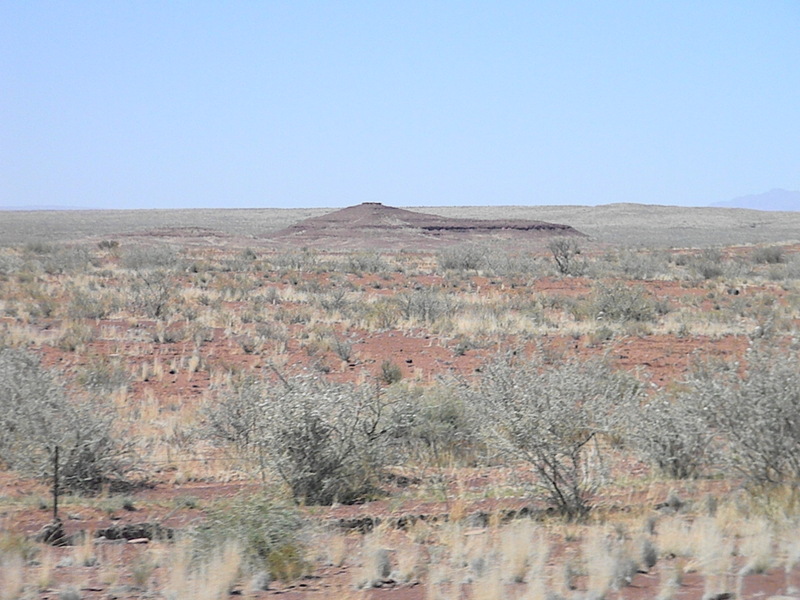 The terrain continued to change – from sand, rock buttes, and scraggly trees to the same endless sea of stones, bushes and occasional small hills. I twice spotted a type of raptor sitting atop the power poles running alongside the highway we were on. I wondered if they were fish Eagles? They looked much like our bald eagles. 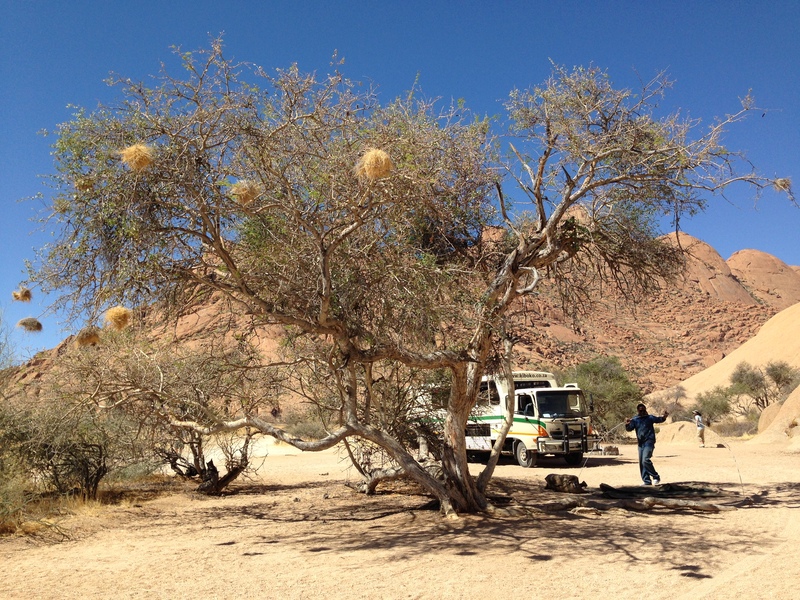 We stopped for lunch under a feather tree – my name for it – it’s actually a camel thorn also know as an acacia tree (they have 2 inch long spikes on them). 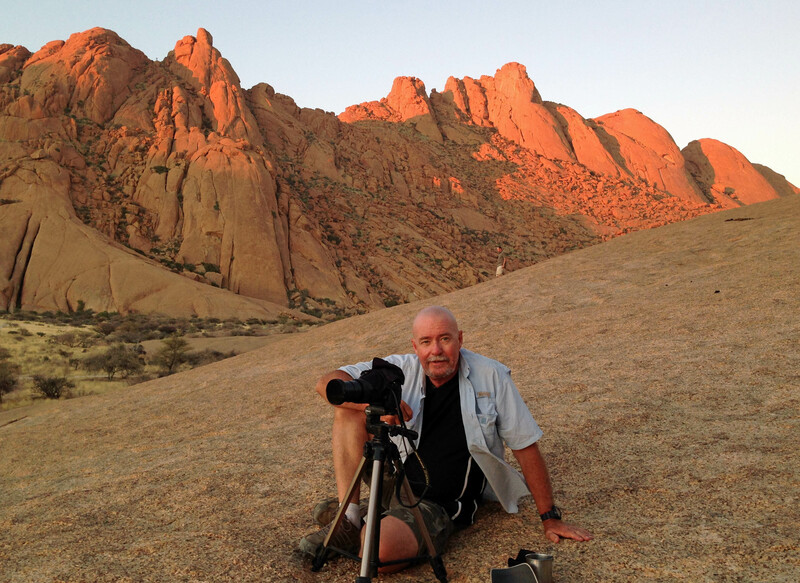 When I went to answer the call of nature, I had an encounter with a camel thorn – it went right through the sole of my Sketchers and into my foot. Extremely painful for 5 minutes or so. Continuing on, we began to see more farms and game farms – our attention drawn to the fencing around these farms. Some of the fencing looked just like a regular fence – fence poles, wires etc. Others, had two layers of fence, it seemed – imagine a regular fence with another one above it, each supporting the wires with upright strips of wood, to make it that much taller. 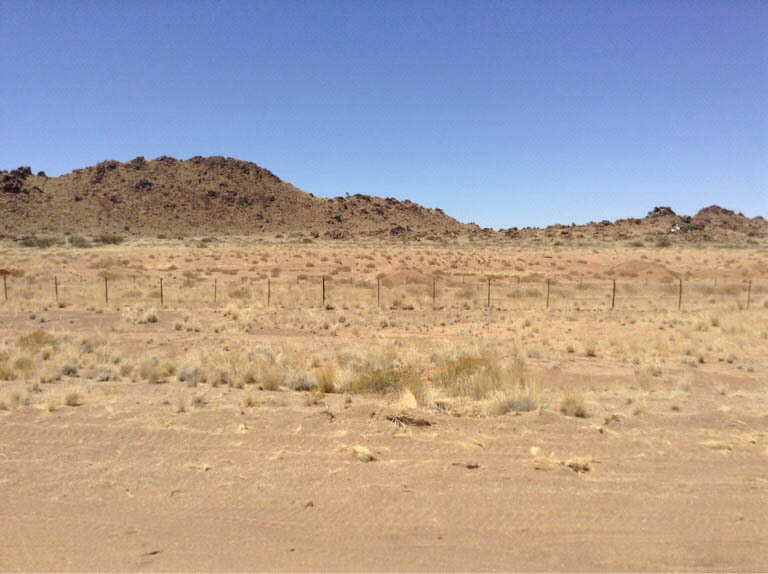 The private game farms had this much higher, more distinctive – looking fencing than the other, traditional farms. FINALLY!!! The long anticipated red dunes. 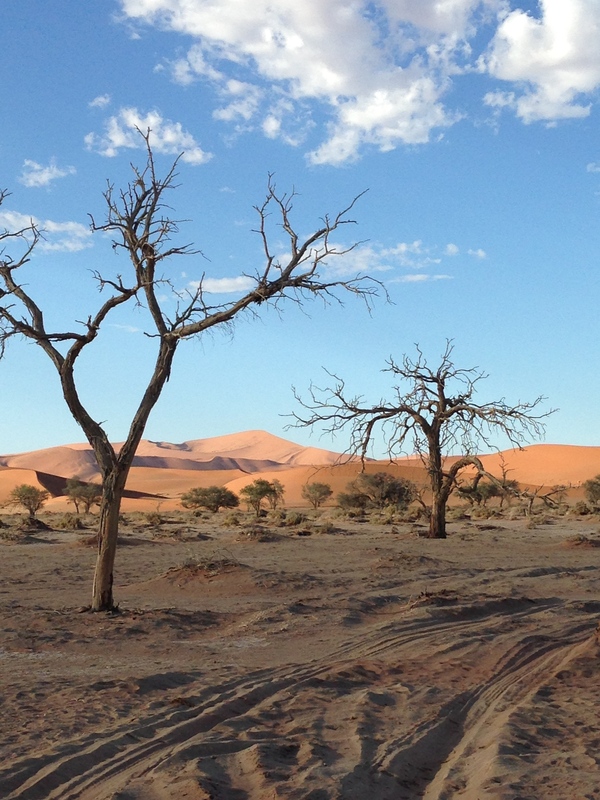 The pictures below show the first sighting of the red dunes of the Namib desert appearing through the distant haze. We finally arrived in Sessriem at around 3! (The end point on the map above shows you exactly where we were.) 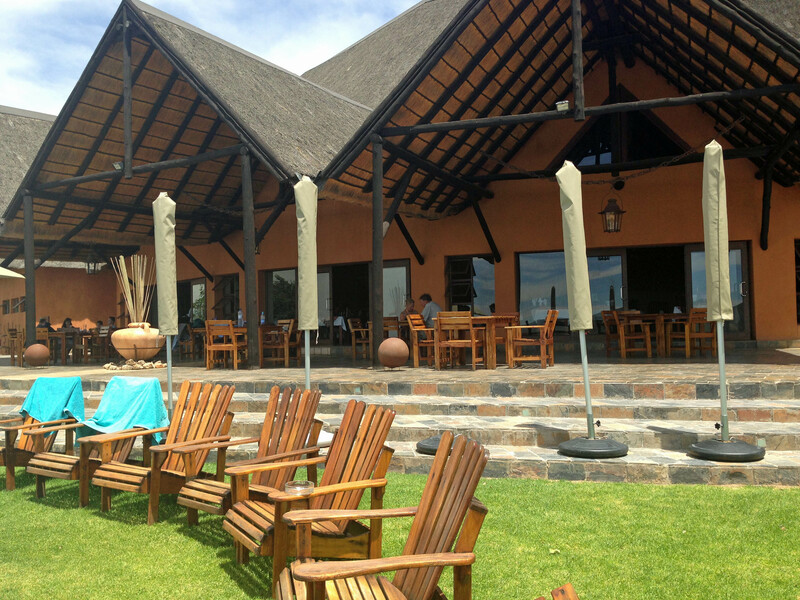 There was a beautiful bar; the high thatched ceiling and large open windows making it very airy. We met Rhea who joined the tour from California. 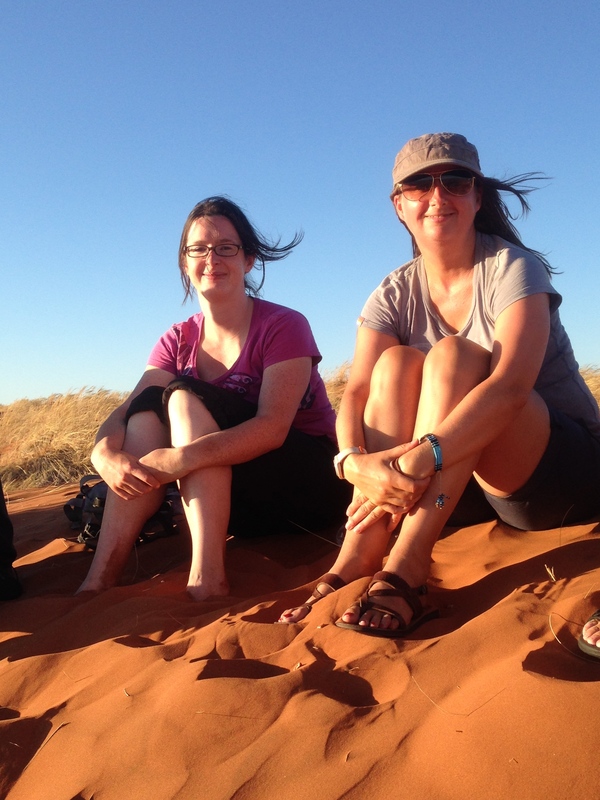 Had a drink, set up camp, played Uno accompanied by uproarious laughter as we nailed each other with the cards, had a cappuccino in the bar and at 530 set off to climb Elim Dune. 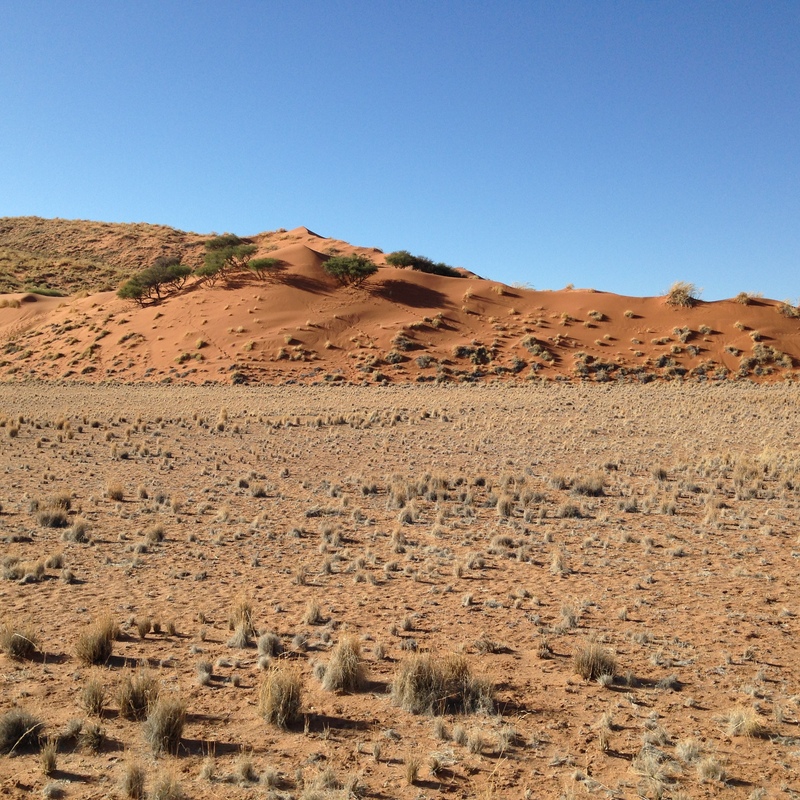 It looked like a baby dune – nothing we couldn’t manage to climb. 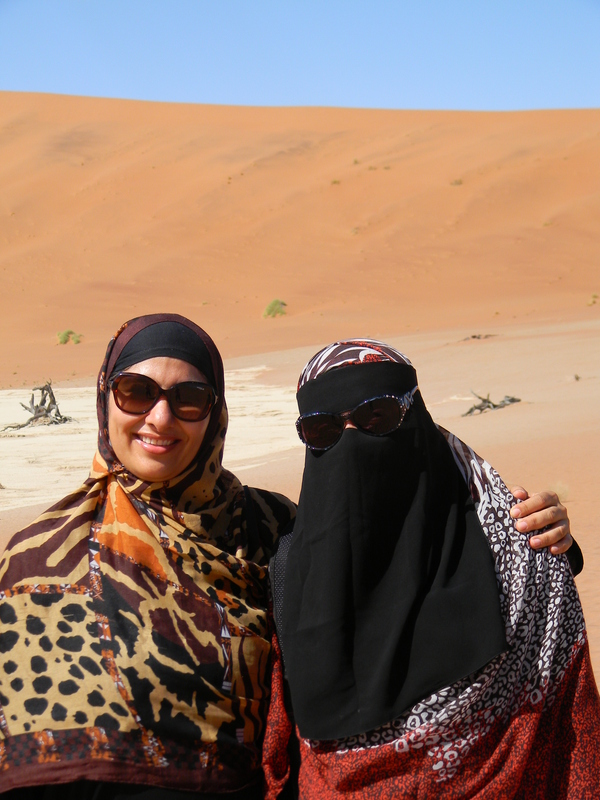 (This over-confidence came from our past experiences climbing the dunes in the Wahiba desert in Oman – we knew it would be difficult but….). Below is fellow adventurer, Jan, just starting his climb. 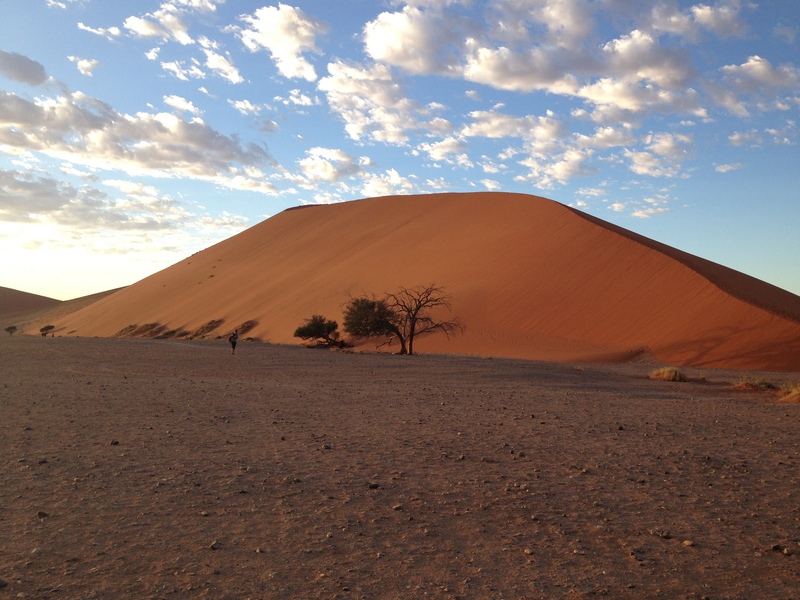 This was to be our practice dune as there would be two other, higher dunes to climb the next day. We managed to climb to the top and spent the next hour or more enjoying the view, laughter, feelings of accomplishment and of course, the sunset. 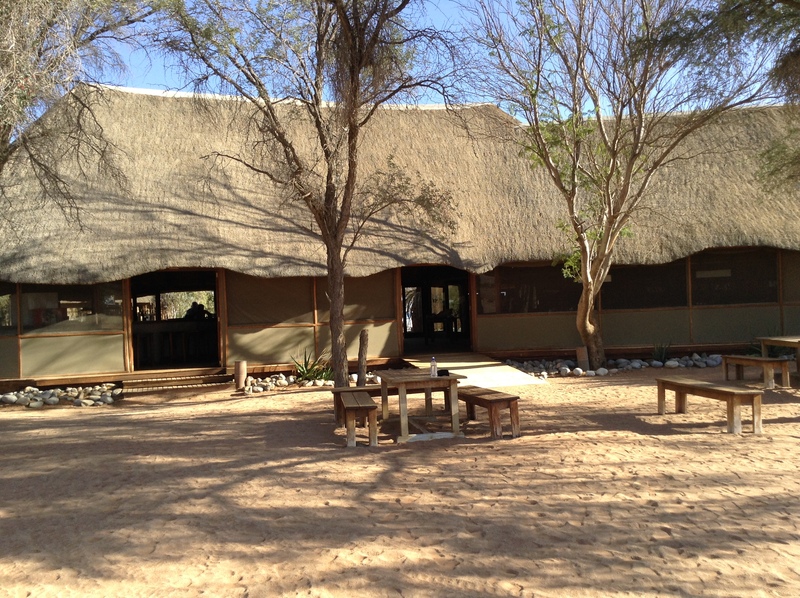 Kgalagadi Transfrontier Park was unusually good to us in terms of the wild game we spotted. The crew told us they don’t usually spot as much big game as we did on this trip. 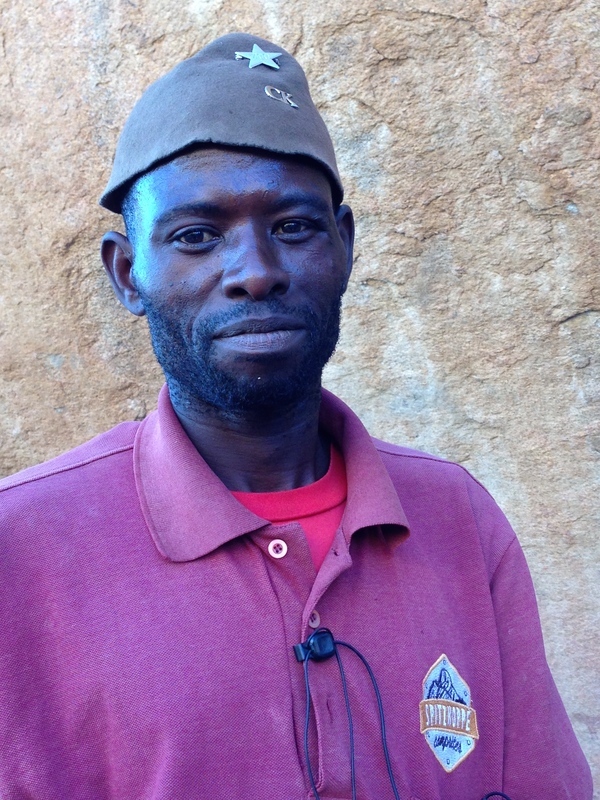 While we ate dinner last night, Richard allowed us a glimpse into his private life – his village connection. I don’t think he would mind if I shared it here – I just hope I am remembering it the way he told it to us. I can’t remember the conversation exactly or how the topic came up but during our drive that day, we had passed so many small villages – villages made up basically of very small huts, often quite a few together, enclosed by a fence that looked like it was made from a collection of a reed or grass-like plants woven together. I had seen several people in city clothes in the villages including a woman in sparkling white capri pants and a brightly-colored blouse. As I said, these huts are tiny – no room for closets – so I was wondering, logistically, where and how villagers could possibly keep and organize their clothes. Richard explained that he comes from a shaman background and that whenever he goes home, he goes back to a more traditional way of living. Most city-dwellers, he said, having come to the city for work, also belong to a village. Whenever people return to their villages, they observe all of the beliefs and traditions of their ancestors in the village. If a man is married and has been away from his family for a week or more, he doesn’t sleep with his wife in the bedroom the first night. Tradition requires him to sleep in the kitchen for the first night as the kitchen is known to be the home of the ancestors. When a man returns to his village he always brings food. Both he and the food stay overnight in the kitchen, to be greeted by the ancestors and to have the food blessed. 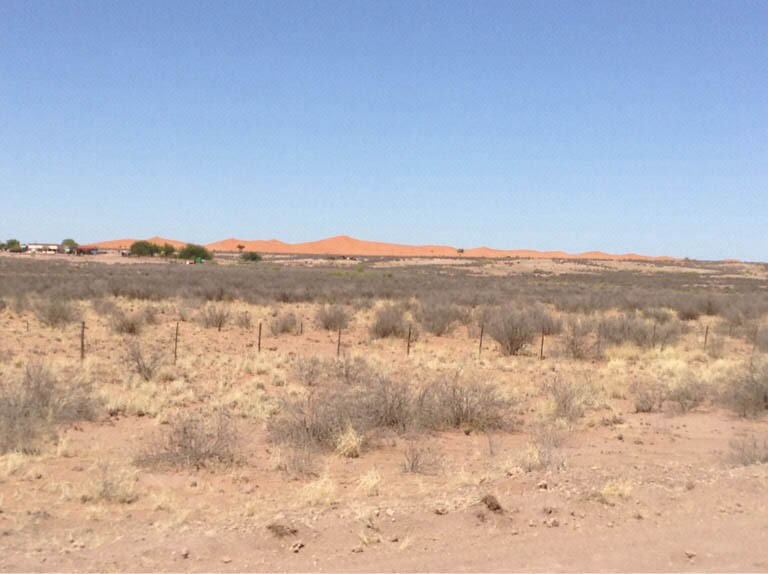 We were on our way to Namibia – this is what the terrain looked like; flat plains, areas of rough and tumble rocks and in the distance, red dunes, making me anticipate we would soon be seeing the red dunes of the Namib Desert but it turned out to be a false alarm. We had a lot farther to go before we would see them! 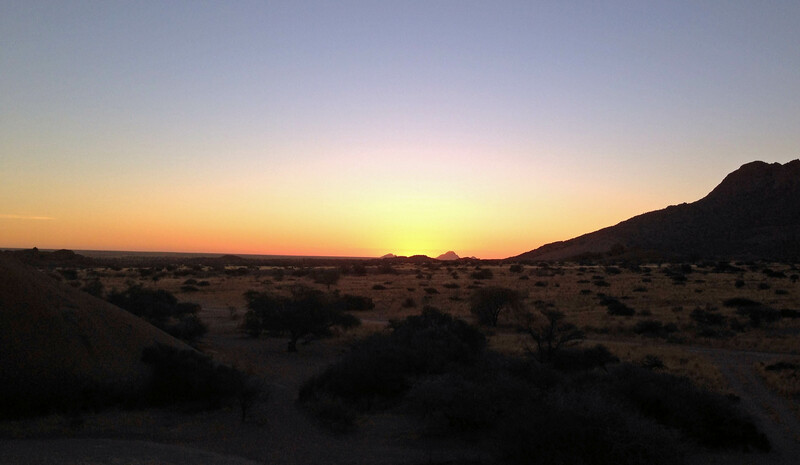 We crossed the border into Namibia quite early. Immigration was quick and efficient but then, there were few other people crossing. First impressions at the border? There were free maps and brochures. The brochures were of course advertising hotels and adventures but I was impressed by the attention to responsible travel as well as educational brochures about wildlife and environmental conservation. Every border we crossed had Ebola posters up, educating travelers about the symptoms and advising precautions. 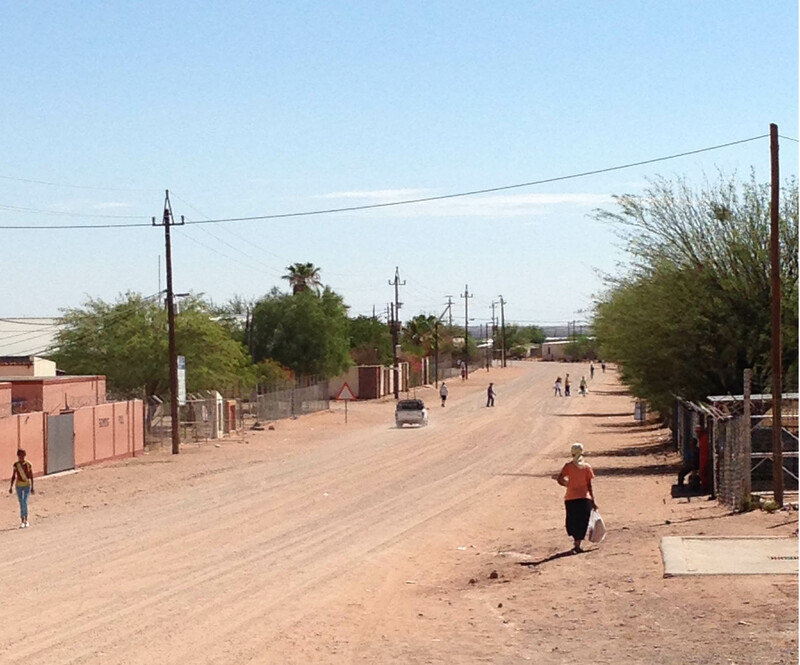 Above is one of my first images of Namibia – the first village we came to. My feelings? 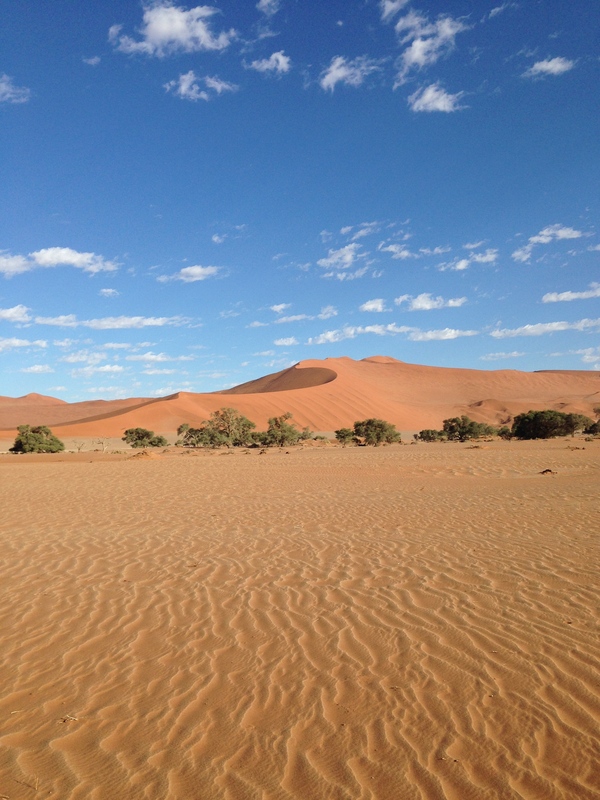 Excitement about seeing and climbing the red dunes of the Namib desert … curiosity about what we would see and do … the growing anticipation of encountering new cultures – specifically, the Himba tribe. 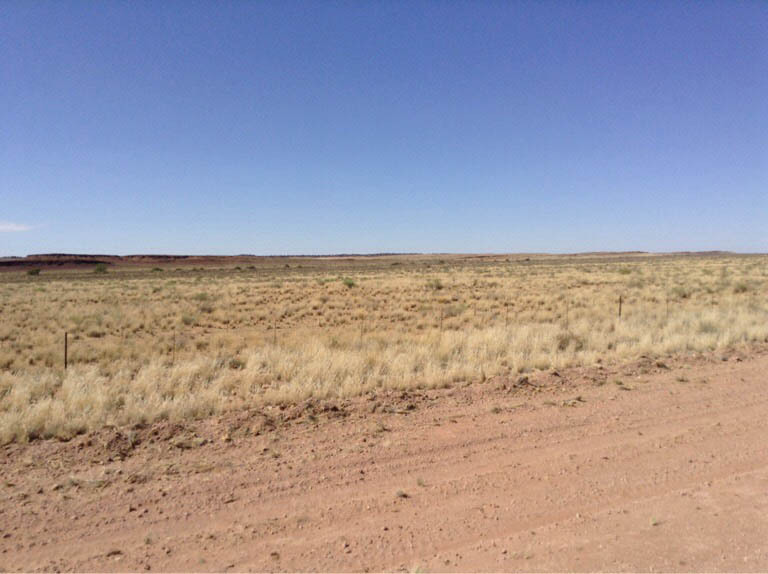 We traveled on unpaved but excellent red gravel roads with regular slow-downs for dips which I think were for water drainage. 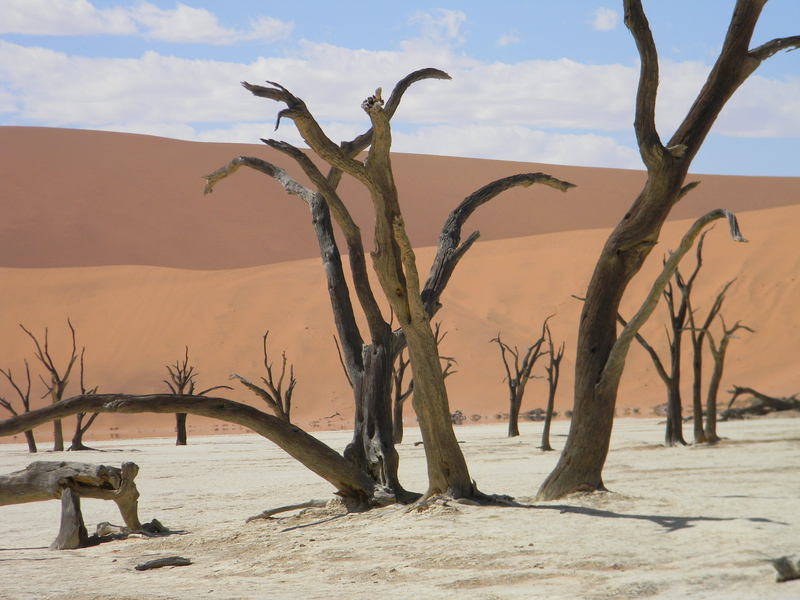 Upon entering Namibia, everyone is required to report, in writing, their entry mileage and type of vehicle (dependent upon gas consumption). The office where you do this gives you a paper with your information on it. 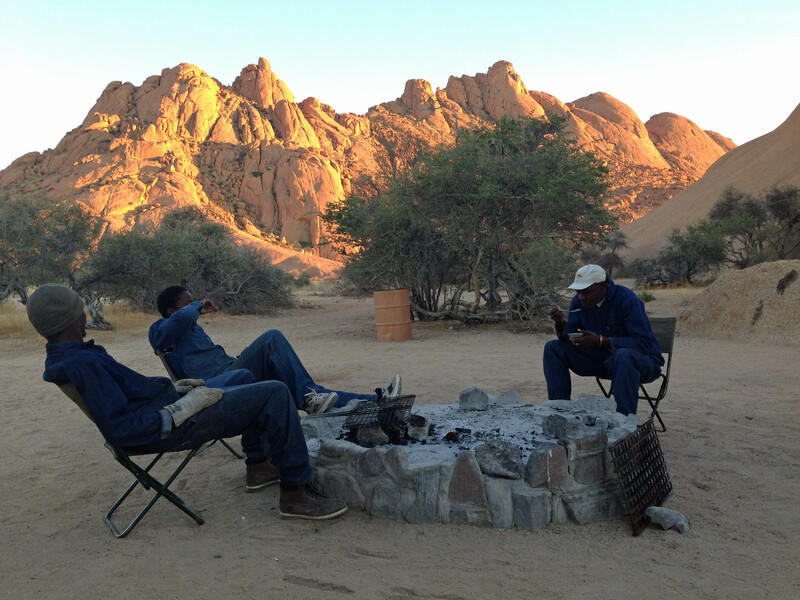 When you leave Namibia, you hand in the paper and pay for the amount of miles you have used on their roads. This is for road upkeep and repair. A great idea I think. 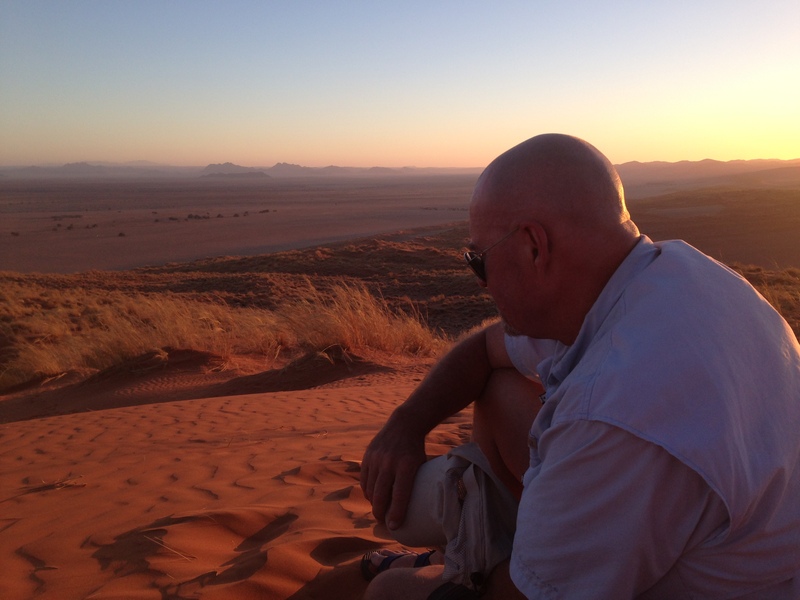 As we first drove through Namibia, I was glued to the widow taking in the scenery. Rachel, who sat in the seat in front of me for the whole trip, drew my attention to the other side of the road where she had seen a row of telephone poles without wires which ended abruptly!! That initiated a lively discussion of and laughter about why that might be so. We never figured it out but it wasn’t the first time we saw that phenomenon. 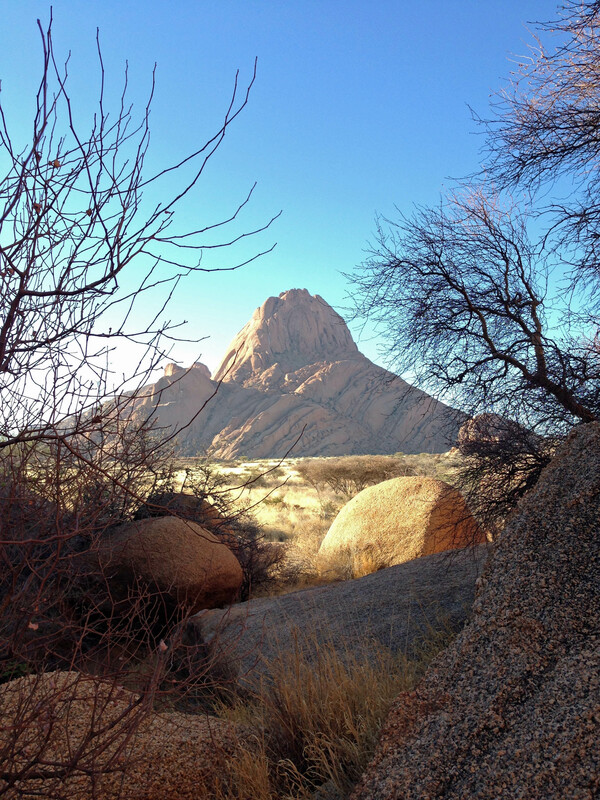 The landscape here is reminiscent of Oman with its tumbled, rock chunk mountains, and miles and miles of rocky plains. We stopped for a quick lunch of yesterday’s leftover pasta with veggies and tuna, meat slices, and fresh melon. 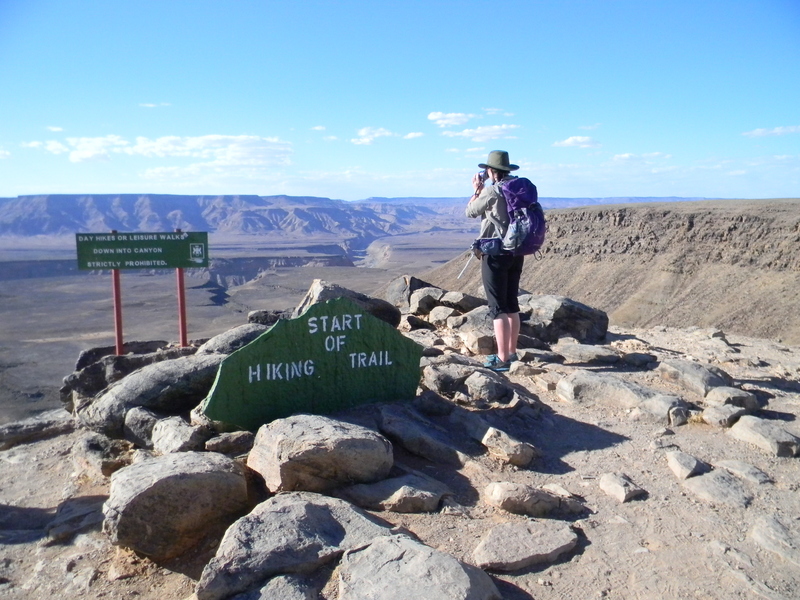 This day we were headed for Fish River Canyon, the second largest canyon in the world. It started to get hot … 38 degrees Celsius, 100 degrees F.
Our camp for the night was at the Canon (pronounced Canyon) Roadhouse and it had wifi so our first order of business was a Savanah light cider and emails. With all of us overloading the system, the wifi was naturally quite slow. 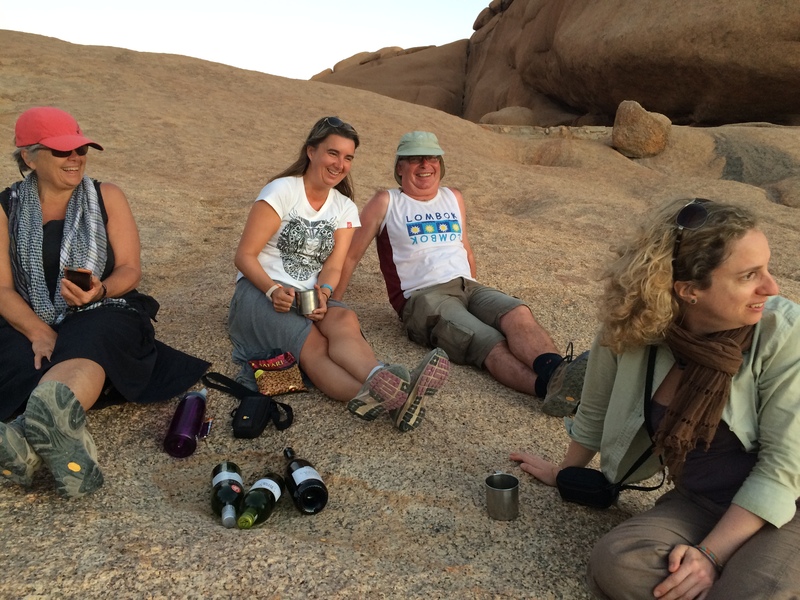 After a few attempts, I gave up, enjoyed the surroundings, cider and company and then set off to explore the camp. 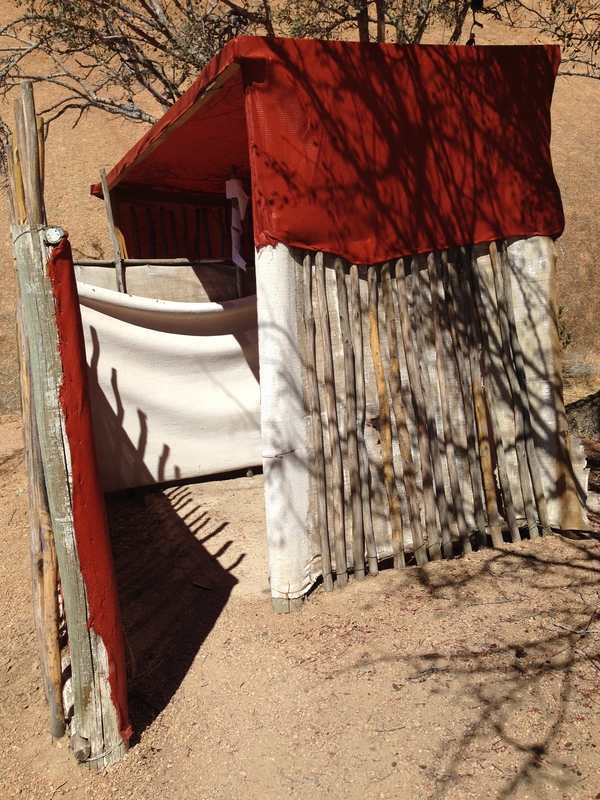 It was our lucky day – the tent was in the shade!! 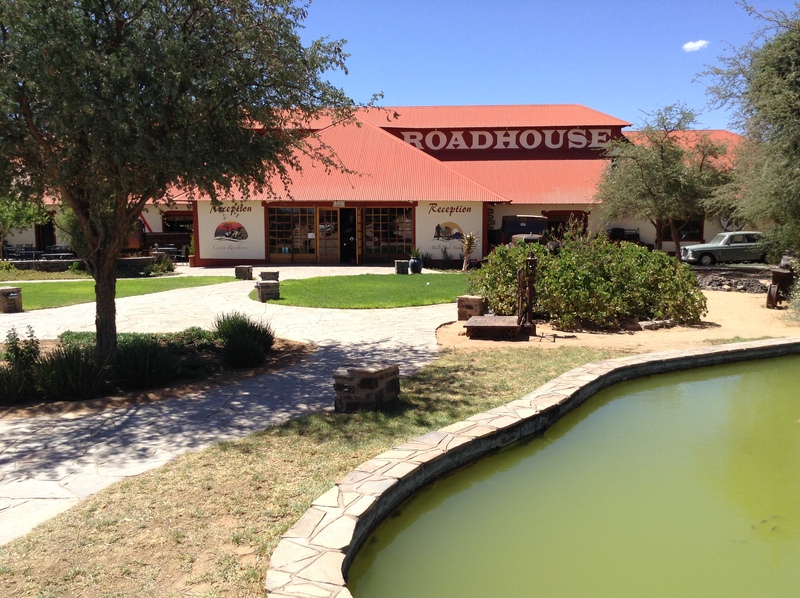 When we arrived at the roadhouse, we discovered a museum-like atmosphere created by antique cars in the garden and a museum of sorts inside. 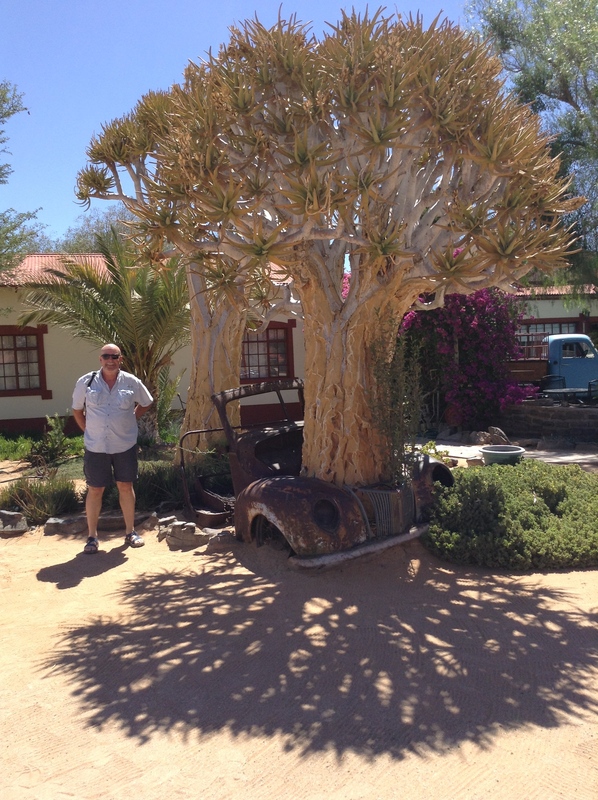 Of particular interest to Mike was this old vehicle with a quiver tree growing out of it’s engine. 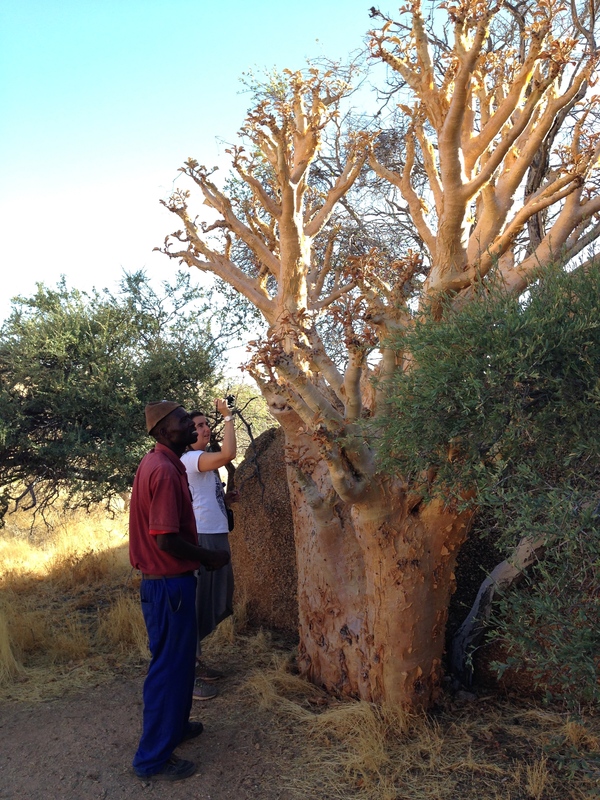 Along the way we had been introduced to quiver trees – the tree the bushmen used in the past to make quivers for holding their arrows. 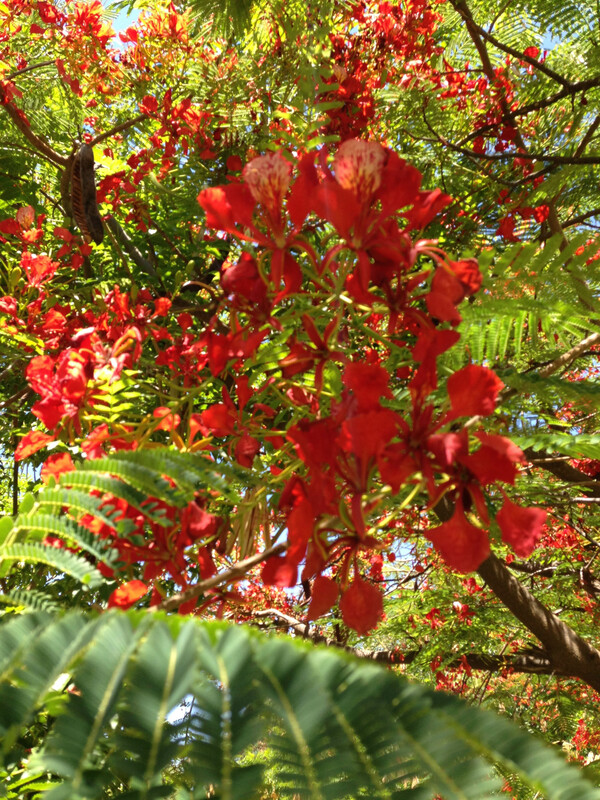 They are beautiful trees – they reminded me a bit of the Joshua trees in Southern California. 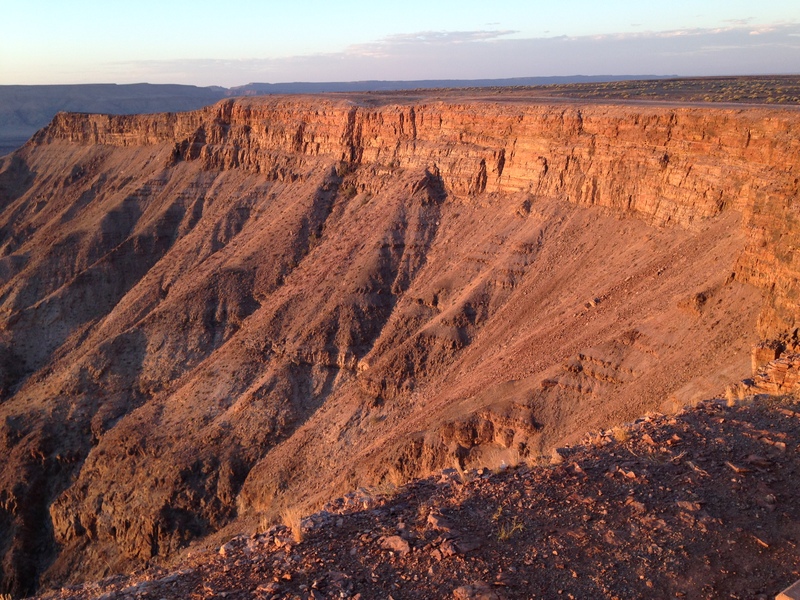 After a bit of a rest, we set off for Fish River Canyon, about 30 km away, to take in the sunset. 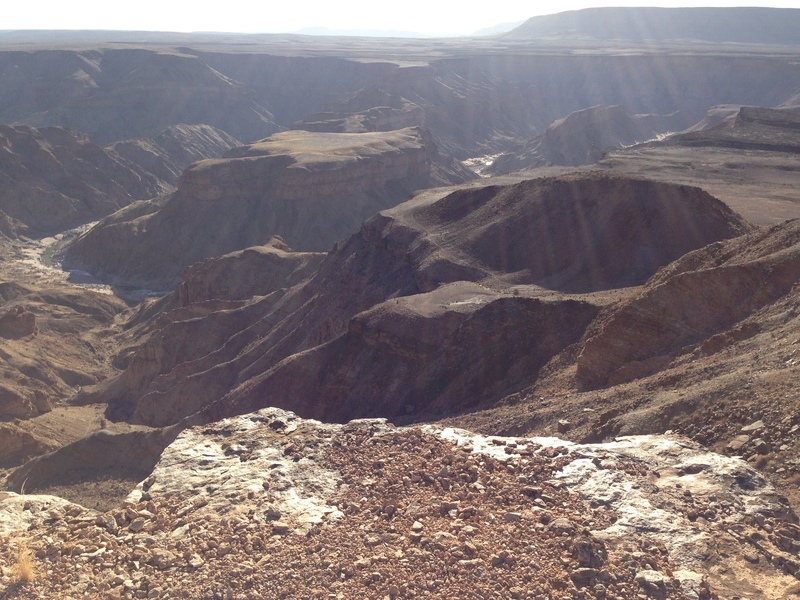 Dumi dropped us at the head of a well travelled hiking trail through the canyon. This trail is a five day hike which leads down to the floor of the canyon, continuing on along the river. 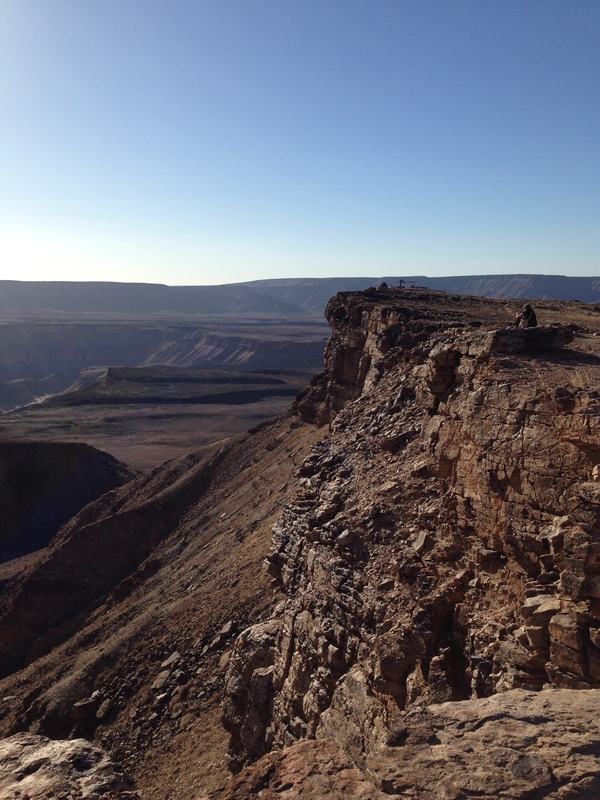 We obviously didn’t do this hike, skirting instead the canyon’s edge back to the main lookout. It was indeed beautiful. Home for a steak dinner, fries and coleslaw. A perfect ending to a great experience!